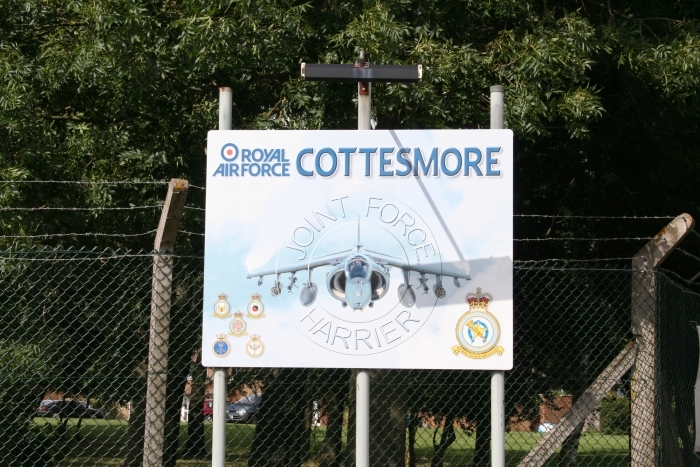 RAF Cottesmore opened in 1938 and originally was used mainly for training. 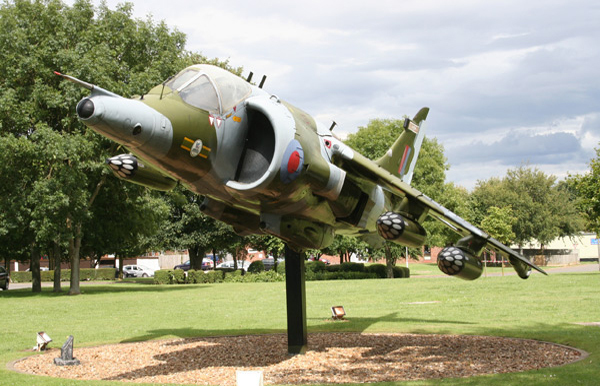 The first aircraft used were Vickers Wellesleys, Fairey Battles and Handley Page Hampdens. 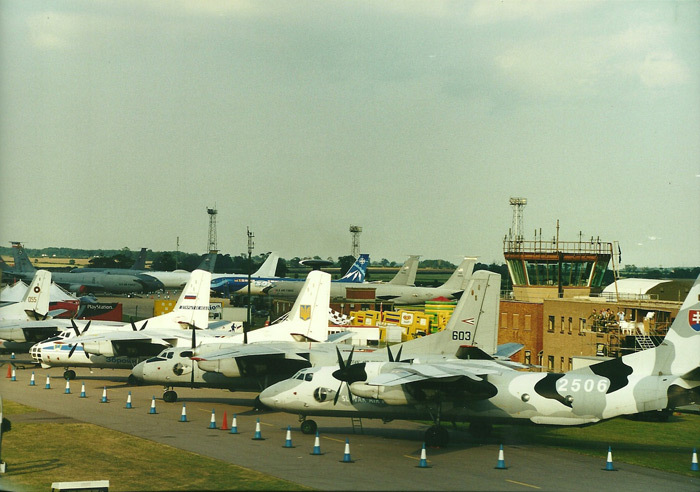 In 1954 Cottesmore became a Canberra base with No. 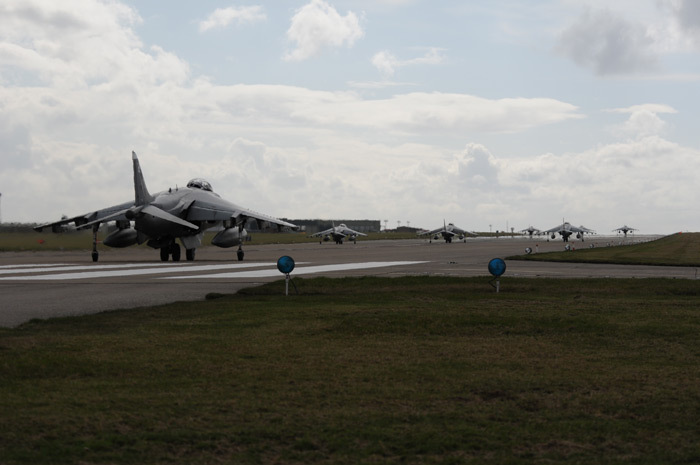 15, 44, 57 and 149 Squadrons arriving. 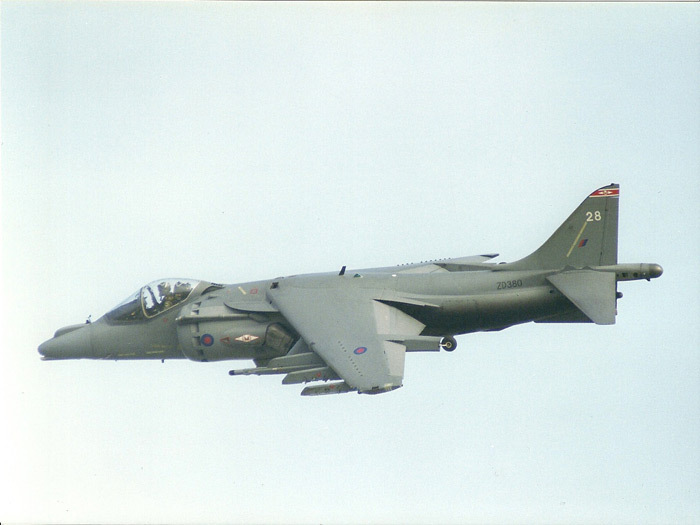 These Canberra squadrons practised high-level bombing missions but their stay was short-lived, by 1955 they had all moved elsewhere. 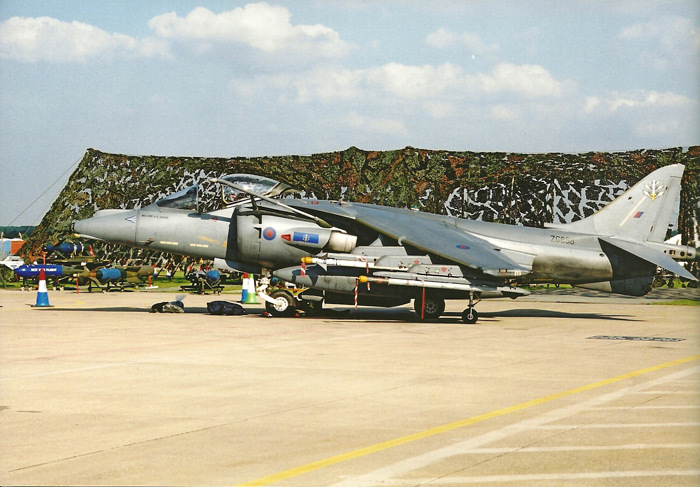 For almost twenty years Cottesmore was a V Bomber base, with Handley Page Victor and later Avro Vulcan aircraft. 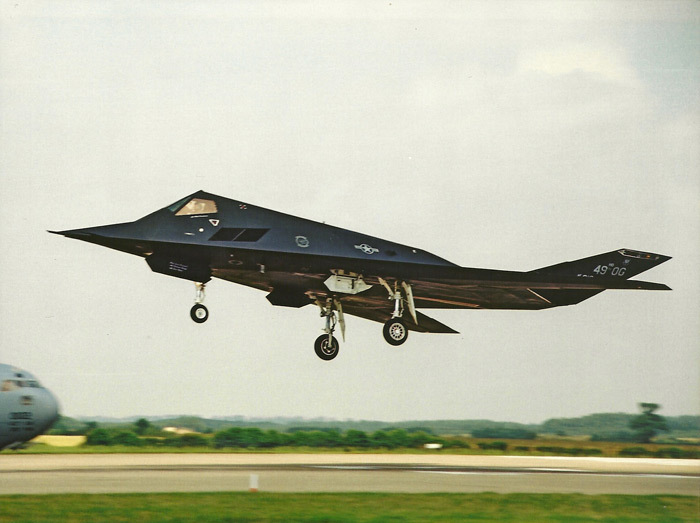 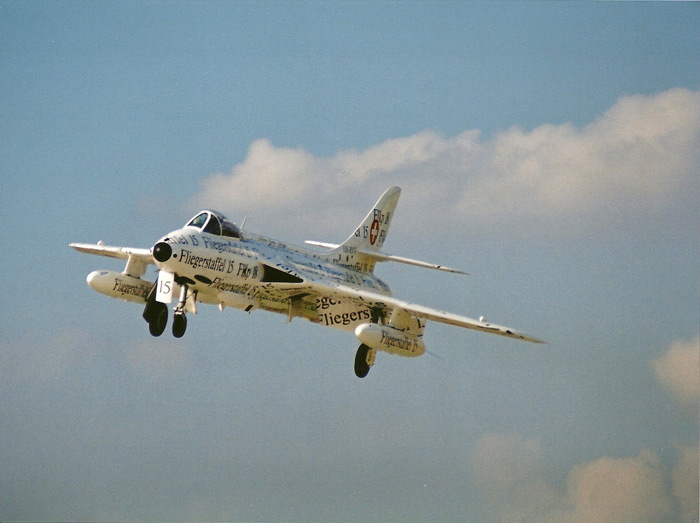 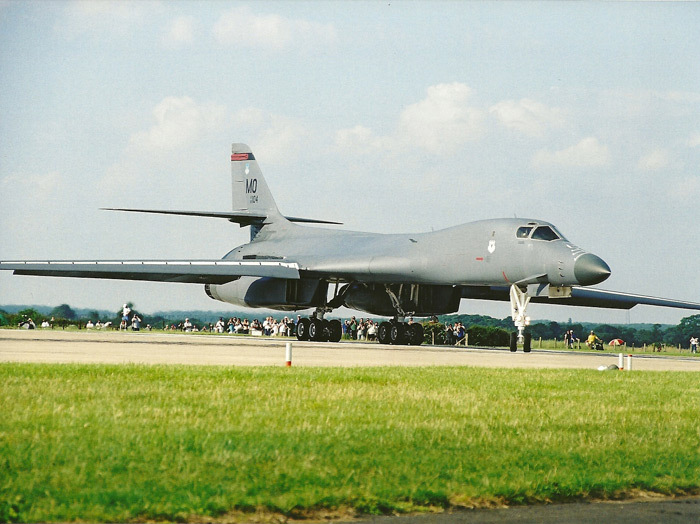 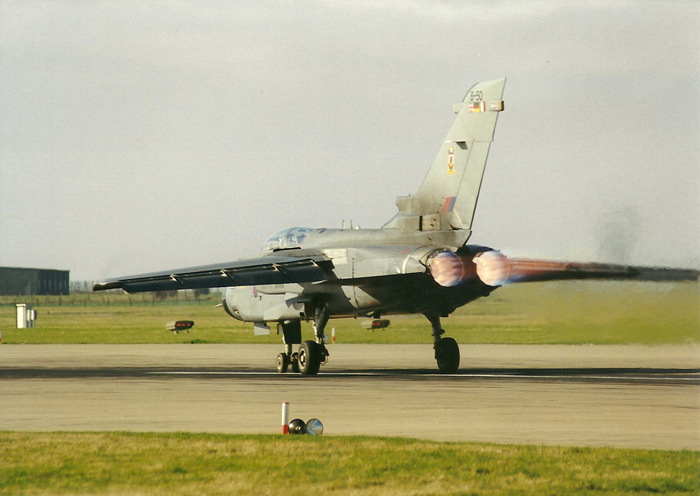 These aircraft were on quick reaction duties and carried Britain's nuclear deterrent. 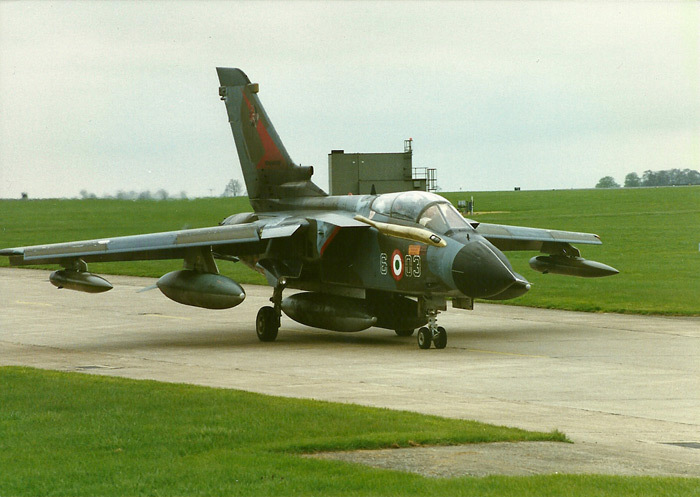 After the V Bombers moved from Cottesmore several other squadrons moved in, including 231 Operational Conversion Unit (OCU), 98 and 360 Squadrons. 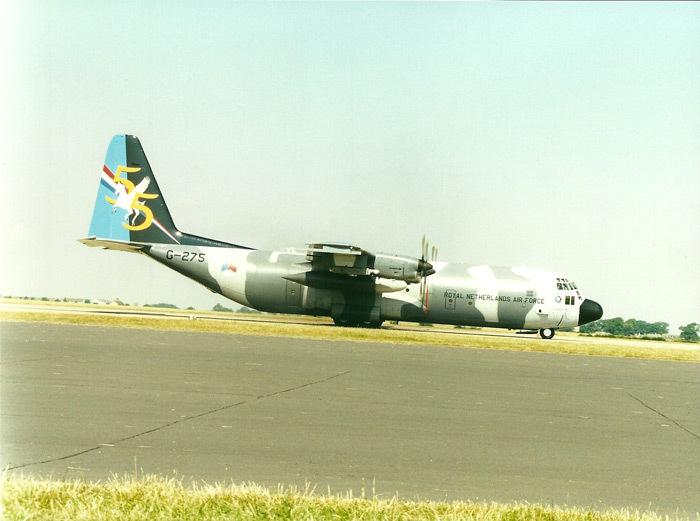 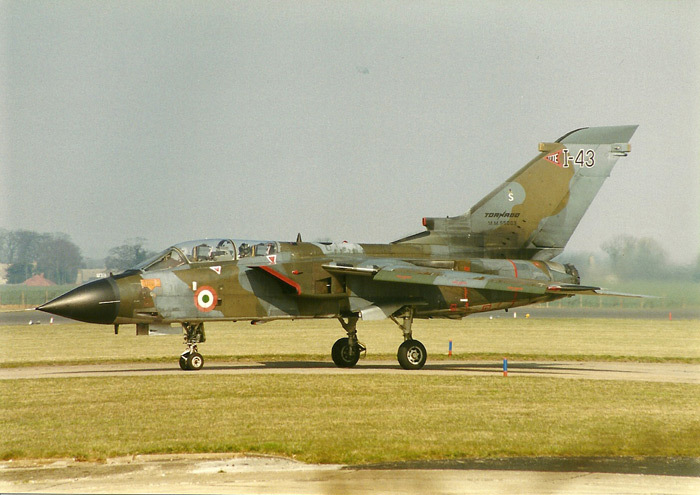 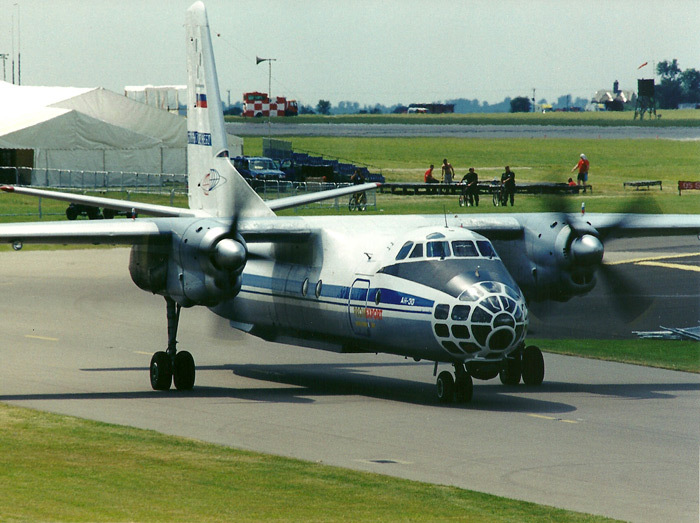 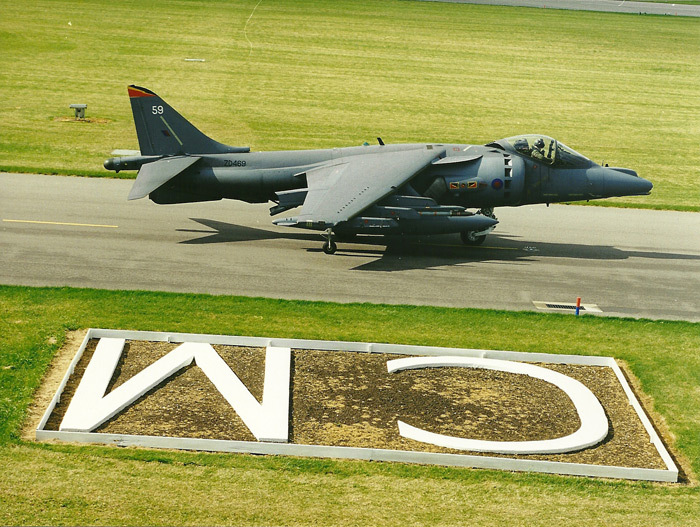 231 OCU eventually moved to RAF Marham in Norfolk with 360 Squadron moving to RAF Wyton near Huntingdon. 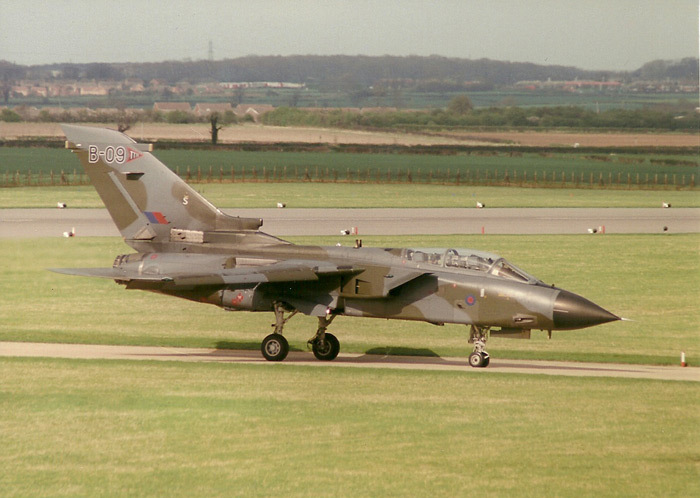 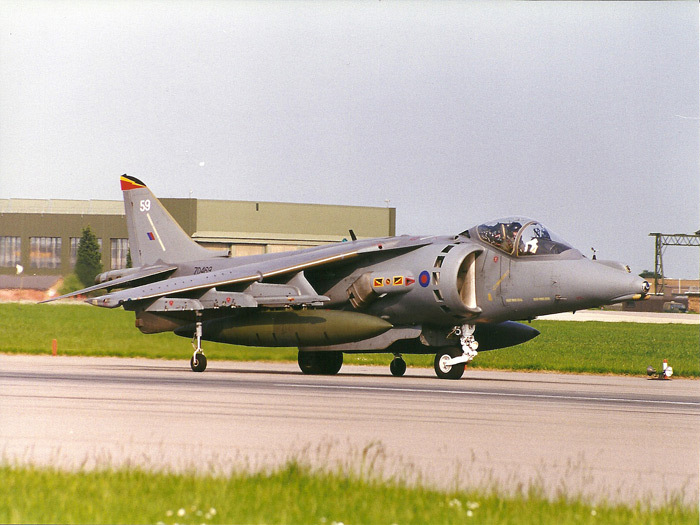 After their departure Cottesmore was put under care and maintenance. 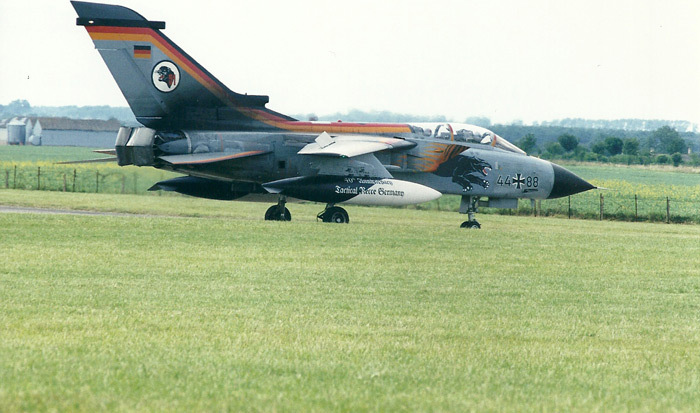 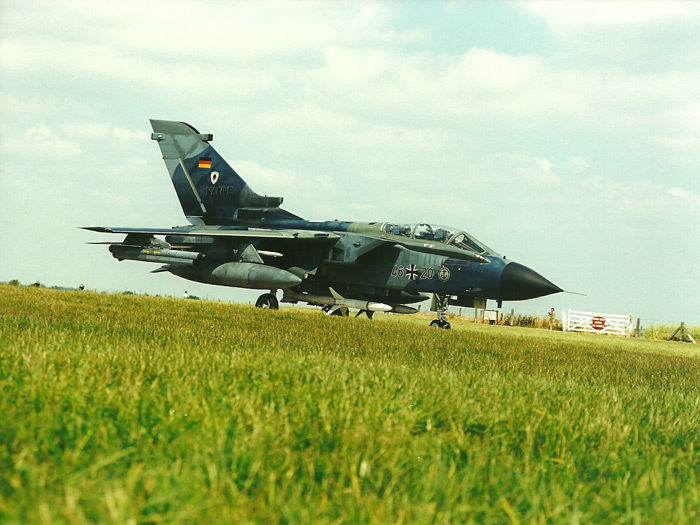 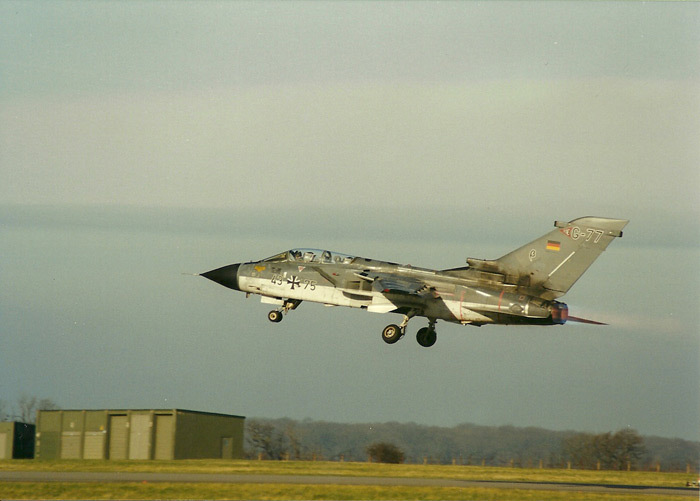 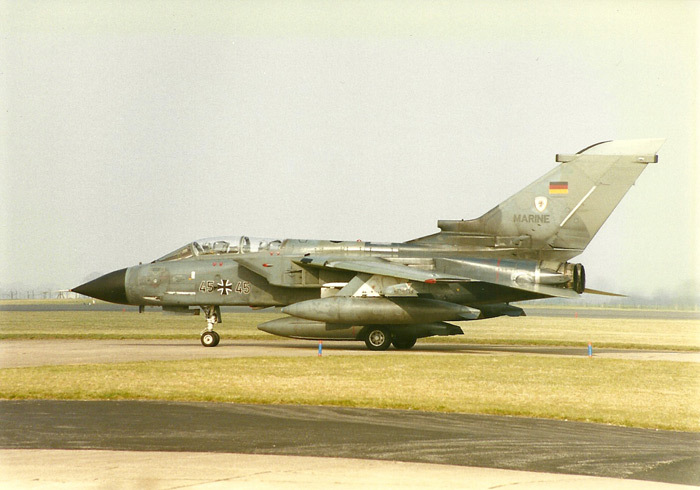 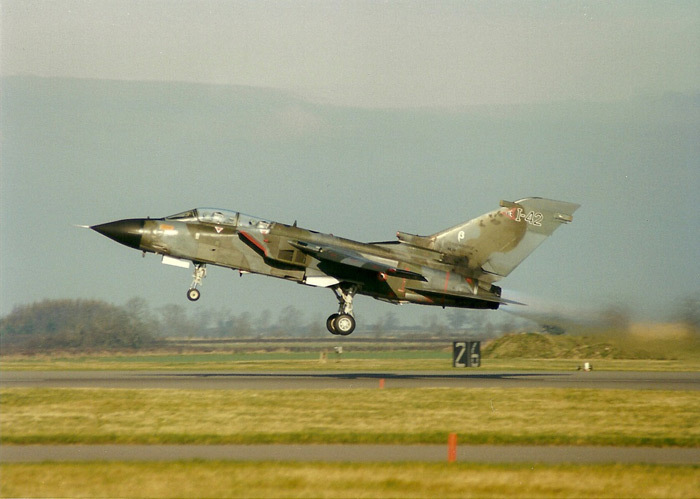 In 1981 Cottesmore became the home to the Tri-National Tornado Training Establishment (TTTE) consisting of three squadrons of Tornado GR1 aircraft, which was formed to train new Tornado crews for the Royal Air Force (RAF), the German Air Force and Navy and the Italian Air Force. 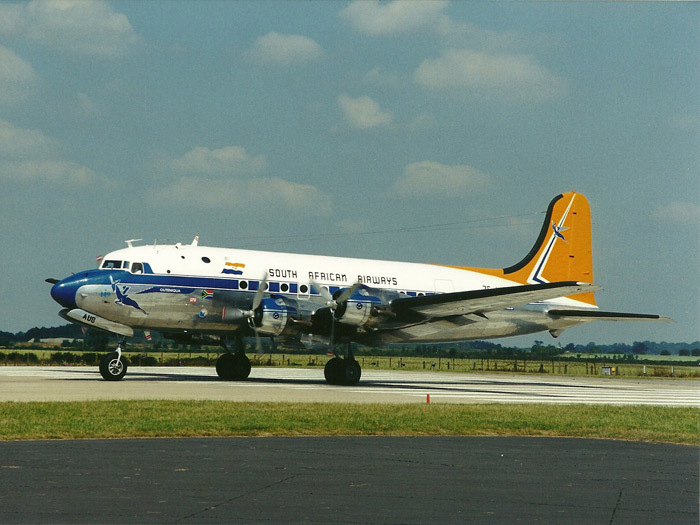 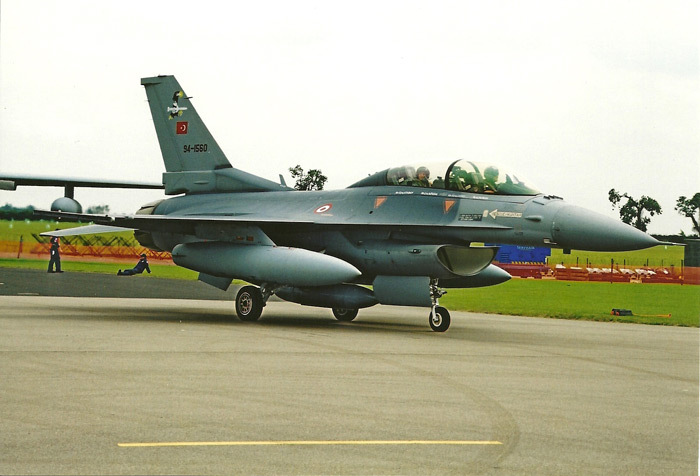 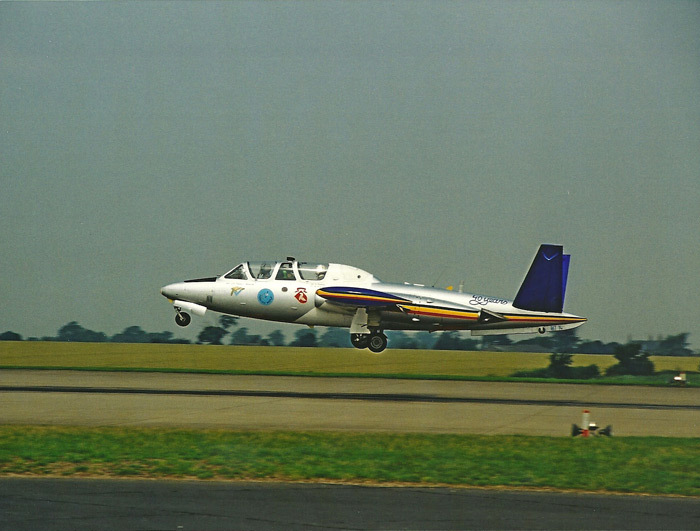 The aircraft were flown by staff and students from all three countries. 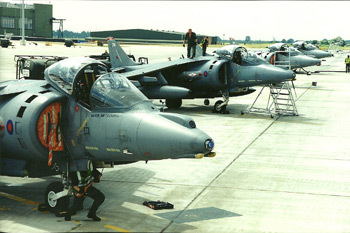 As less Tornado crews were needed the TTTE was disbanded in 1999. 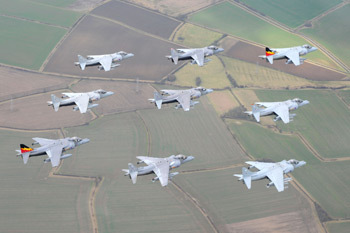 After a period of maintenance Cottesmore was to become the country's second Harrier base, with the first of the two German Harrier squadrons arriving which was No. 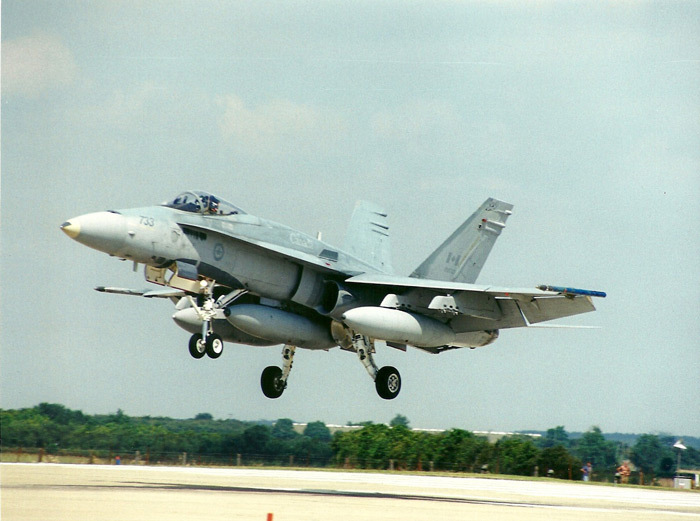 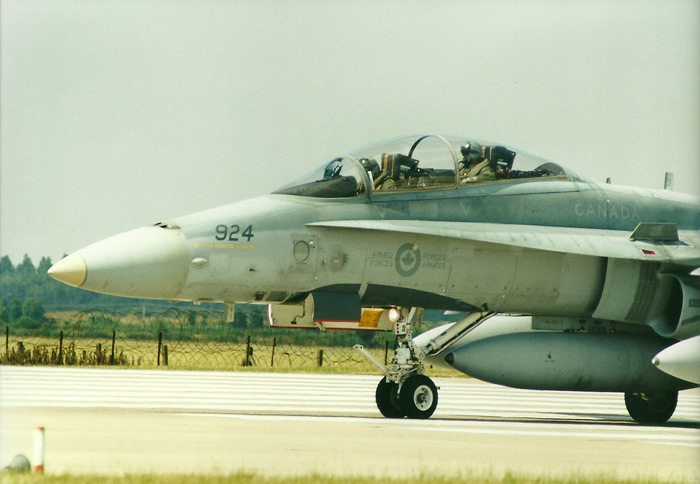 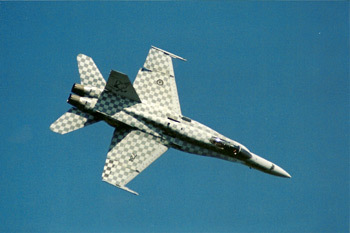 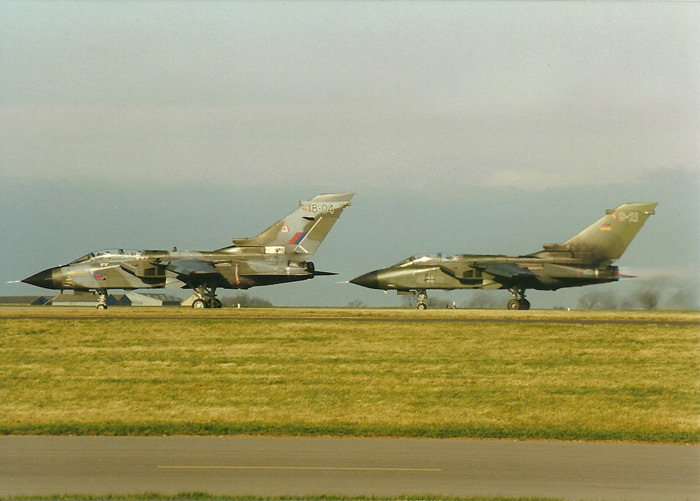 IV (AC) Squadron arriving in April 1999, followed by 3 (F) arriving in May 1999 and No. 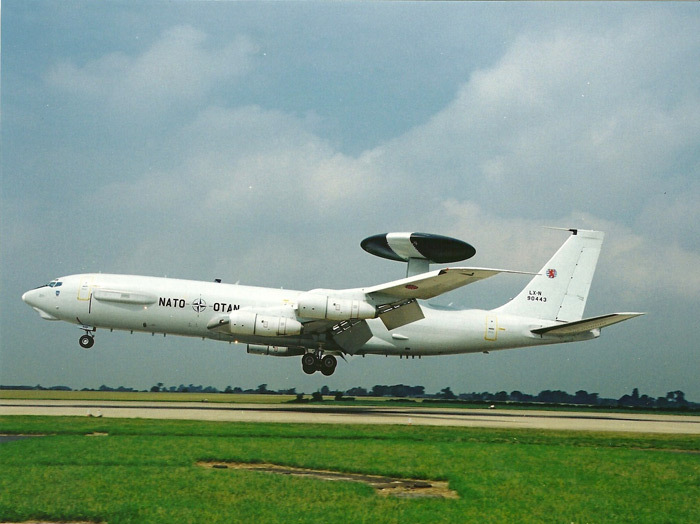 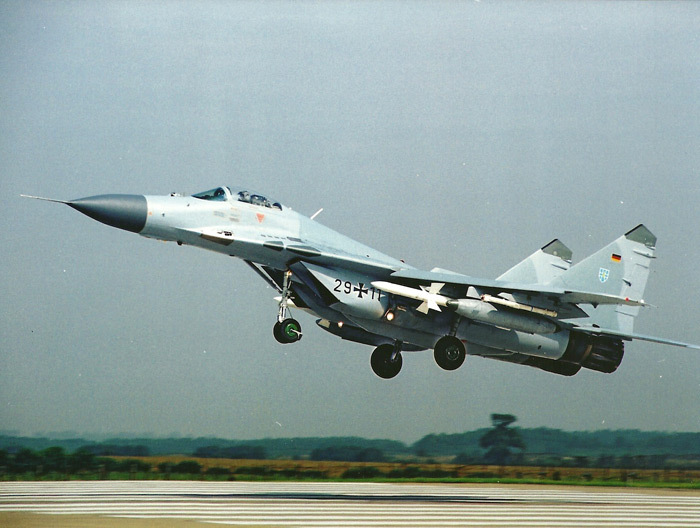 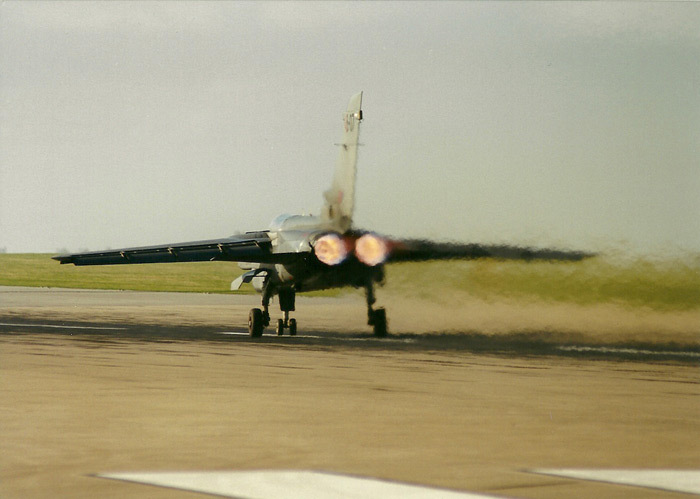 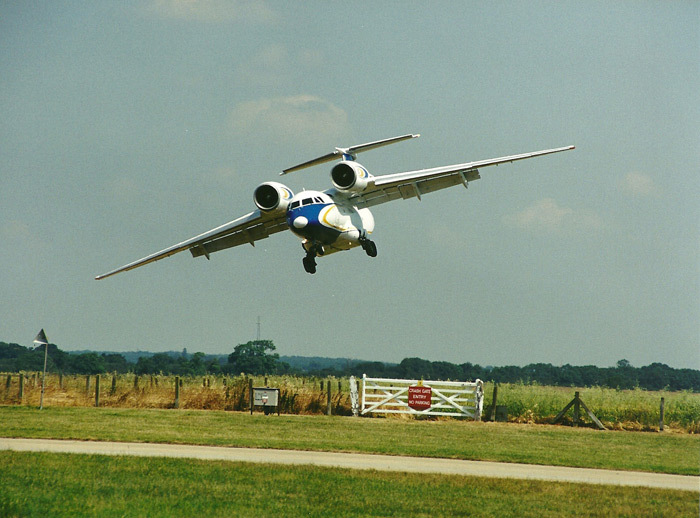 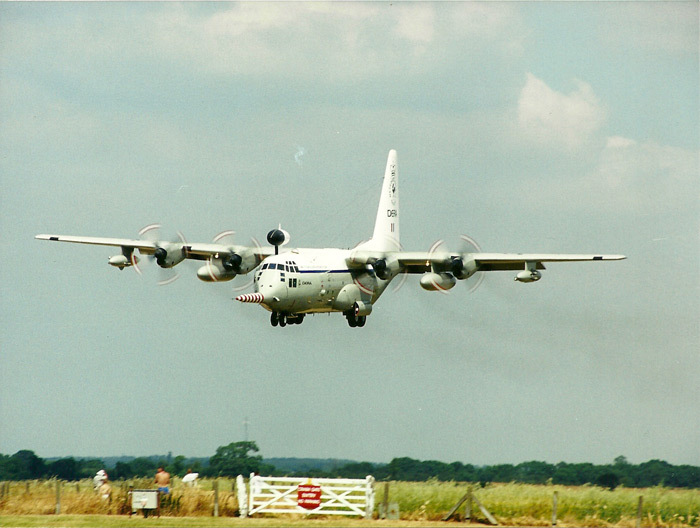 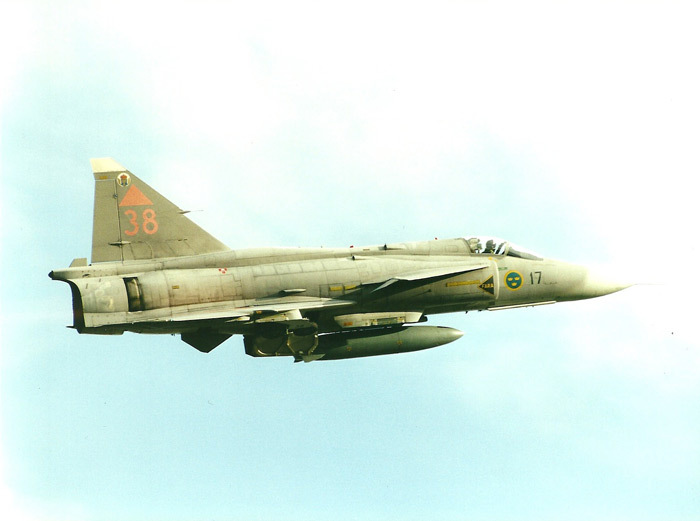 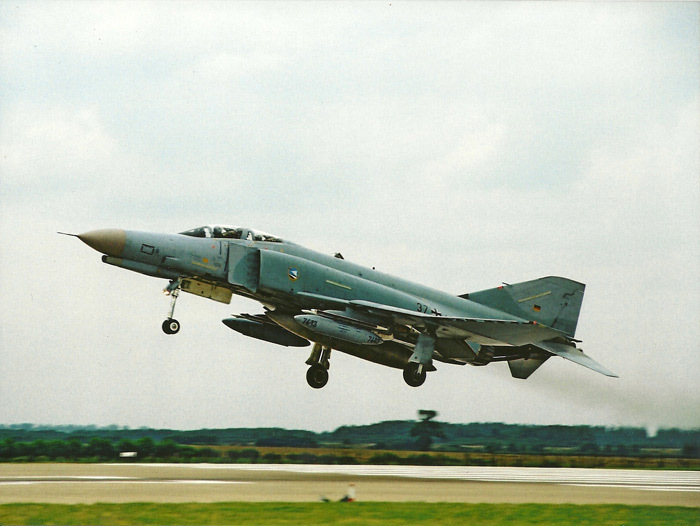 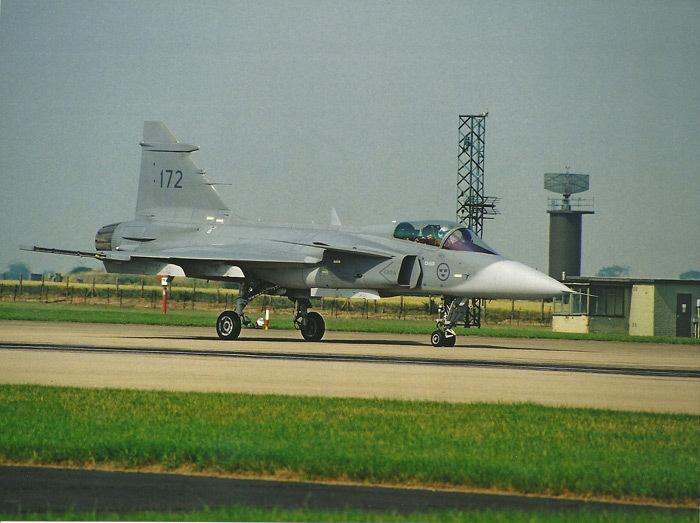 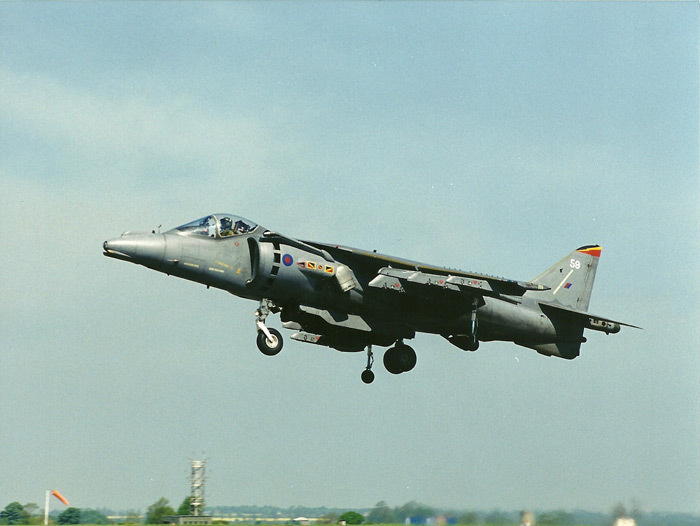 1 (F) Squadron making a short hop over from RAF Wittering in June 2000. 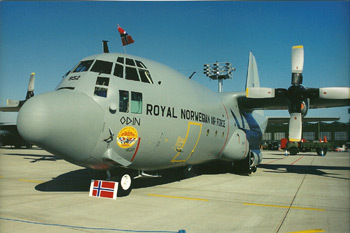 In March 2006 No. 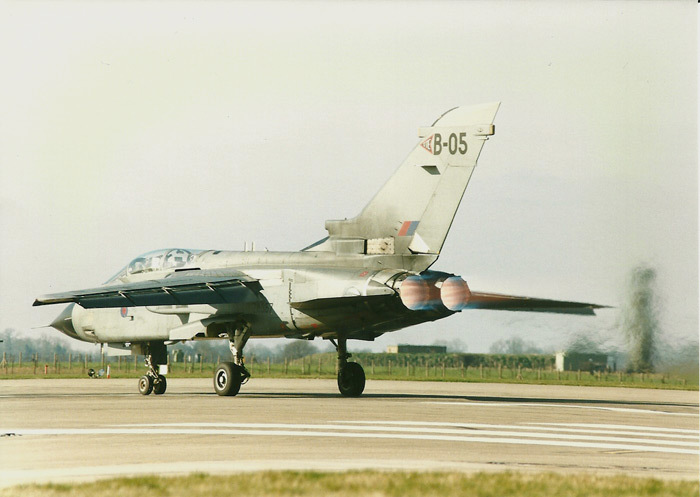 3 (F) Squadron disbanded and reformed the same day as a Typhoon Squadron at RAF Coningsby, Lincs. 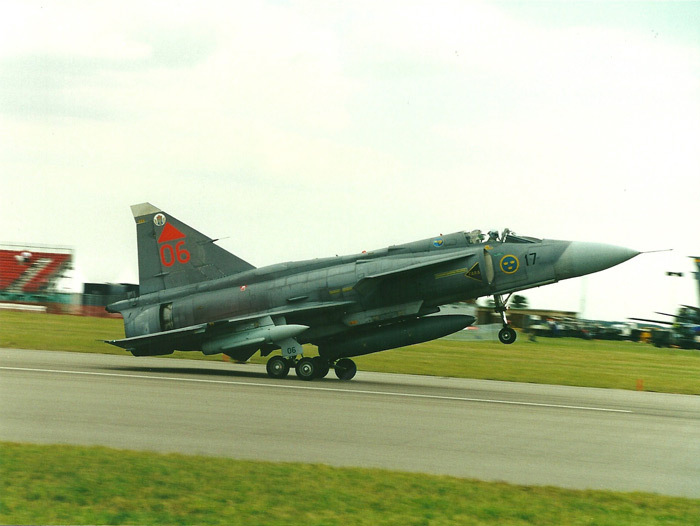 Shortly after No. 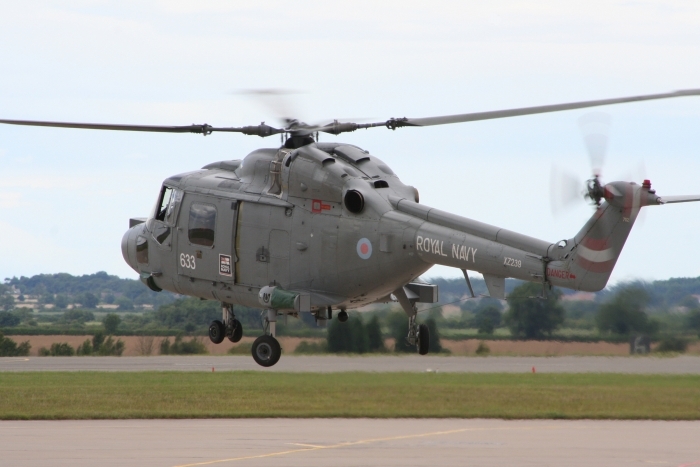 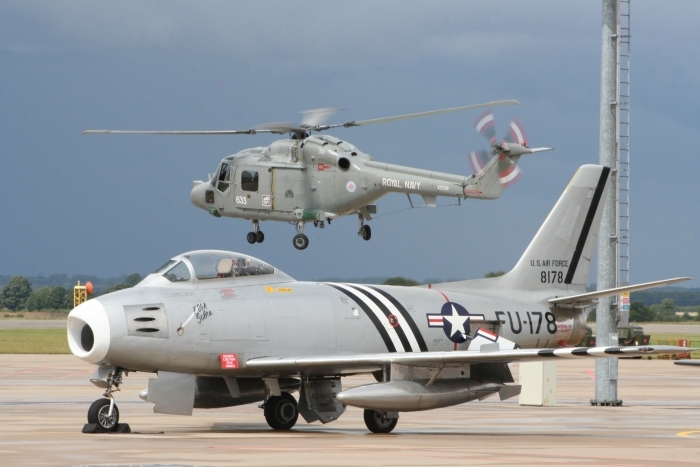 800 Naval Air Squadron formed with a mixture of RN trained aircrew and RAF aircrew from No. 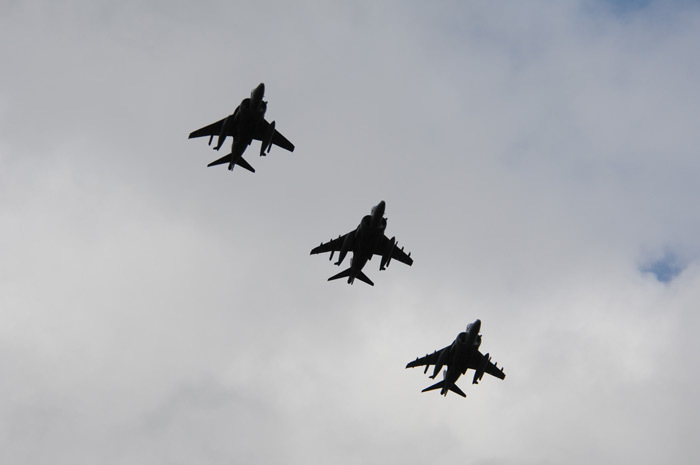 3 (F) Squadron. 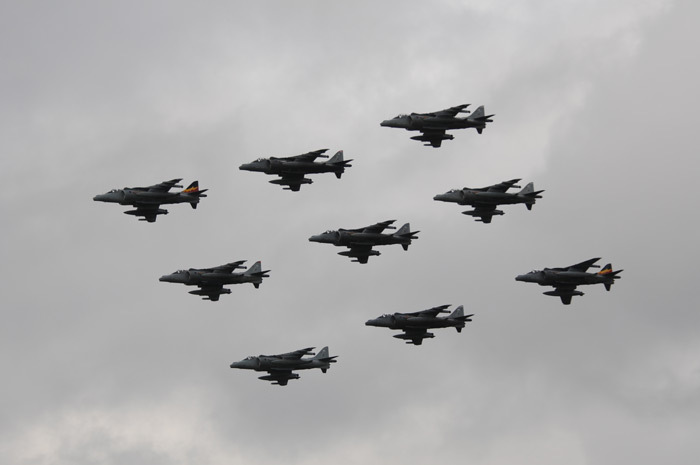 No.s 800 and 801 Naval Air Squadrons have now amalgamated to form The Naval Strike Wing (NSW). 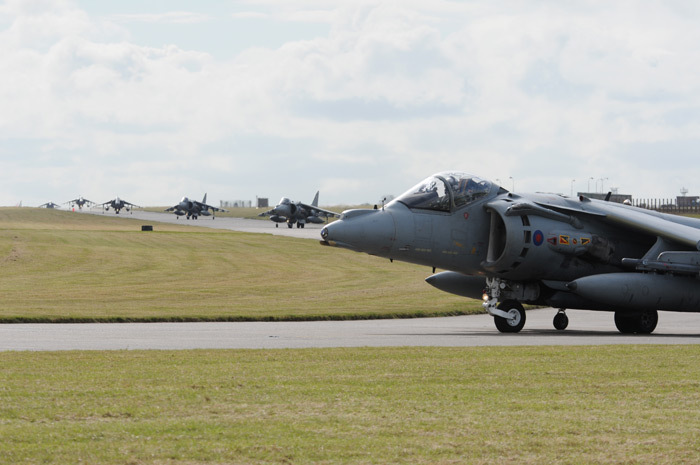 With all units operational, Cottesmore's Harriers now come under the designated title of Joint Force Harrier. 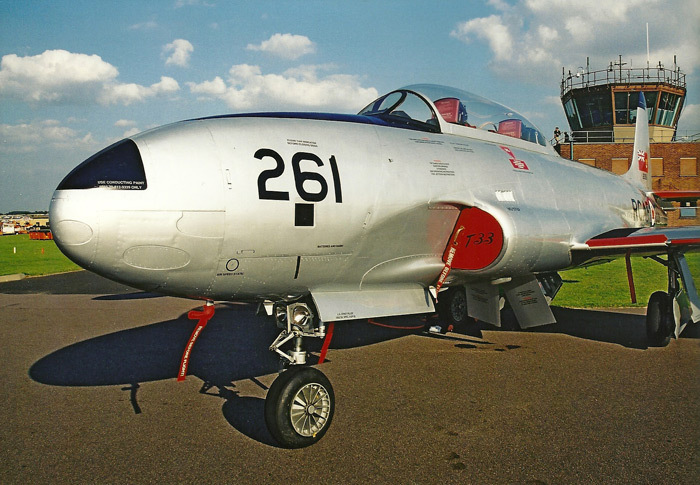 On Friday 26th March, a group of like-minded enthusiasts and photographers trekked the well-worn path through the approach lights, up to the perimeter fence to capture (for posterity) what turned out to be No. 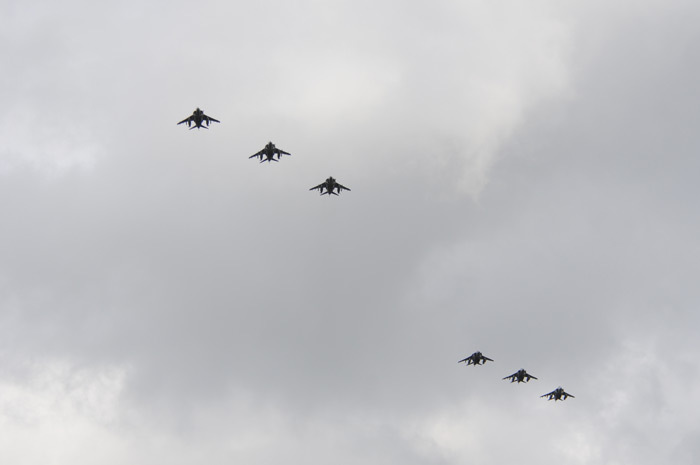 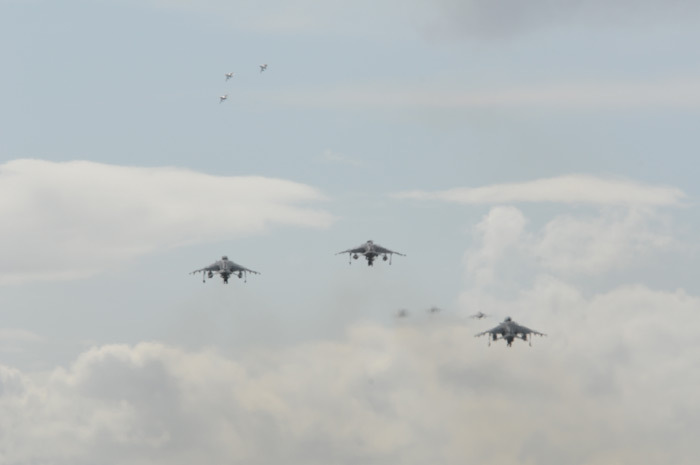 4 Squadron's last diamond nine flypast. 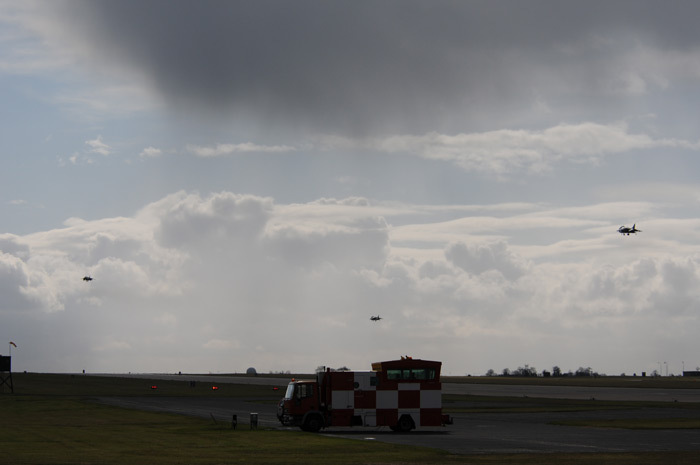 Having braved strong winds and cold weather we were not disappointed. 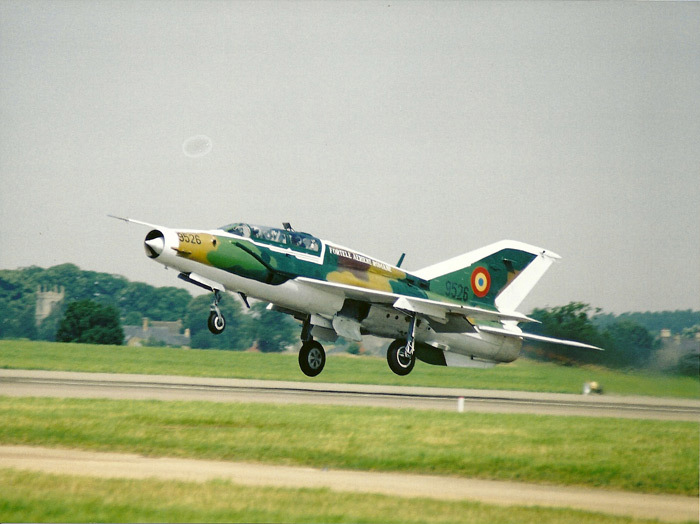 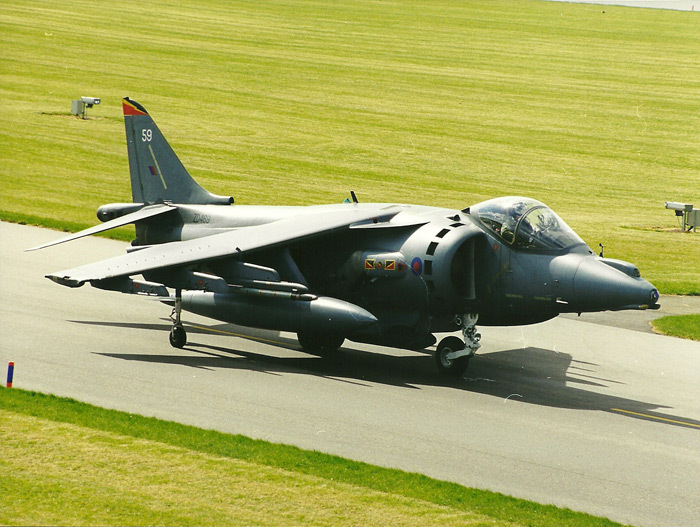 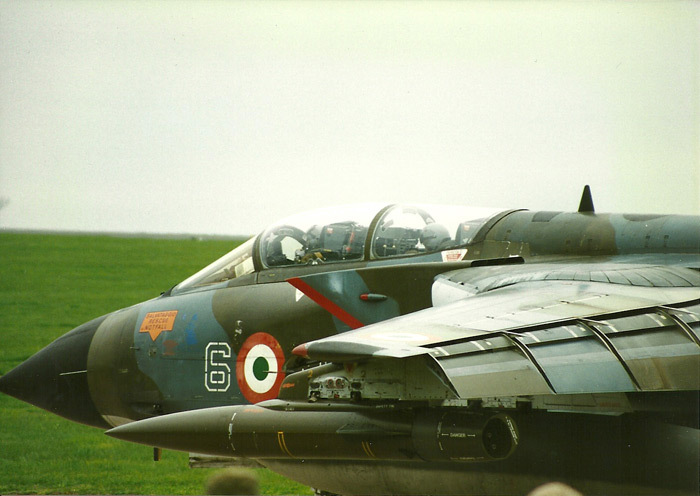 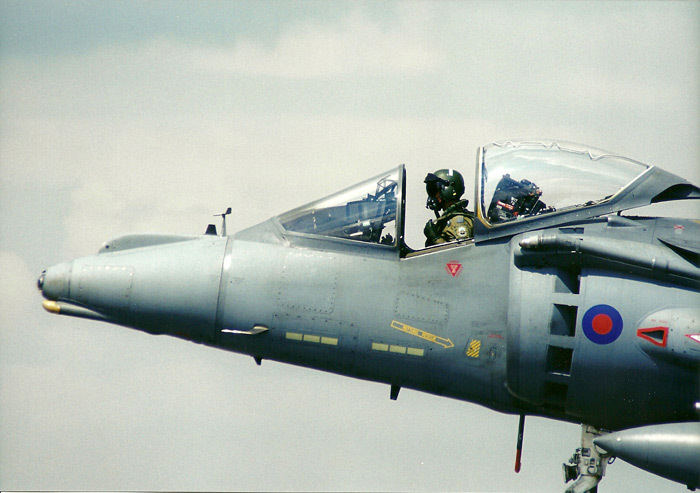 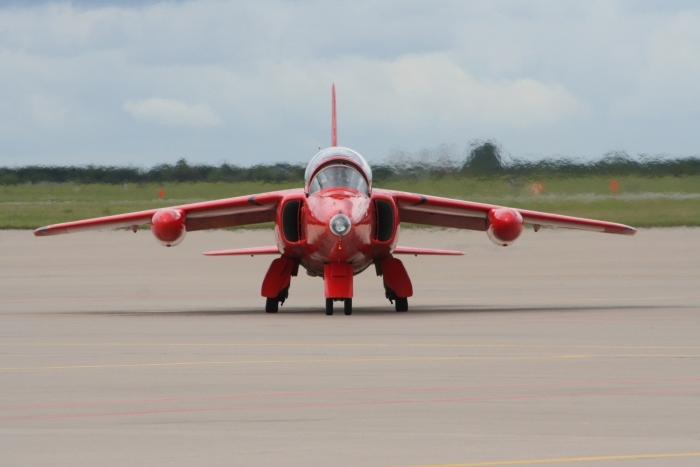 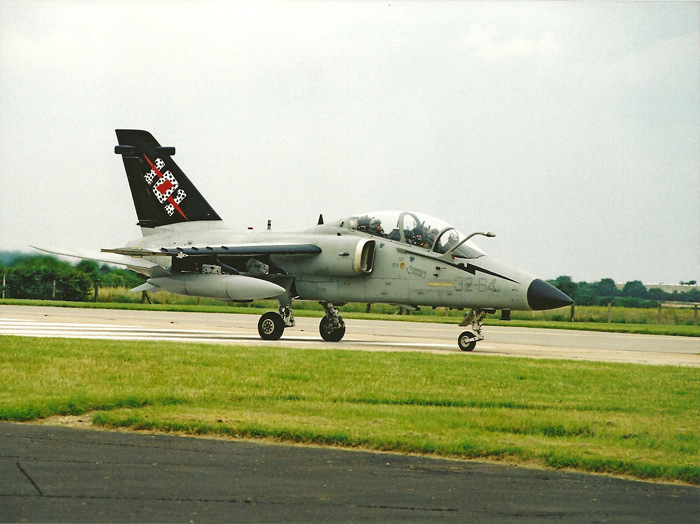 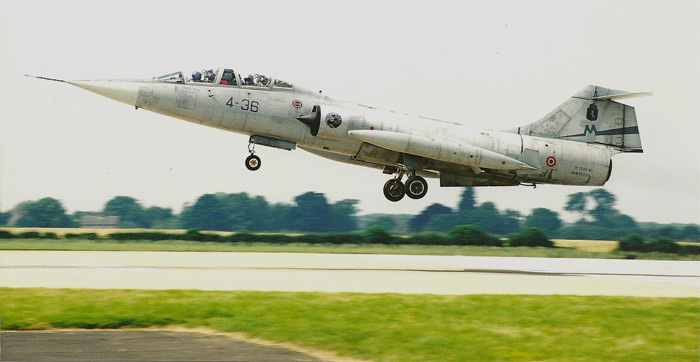 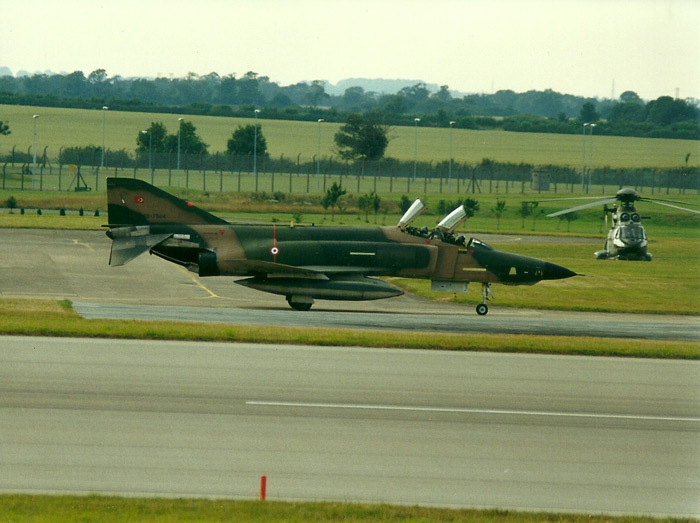 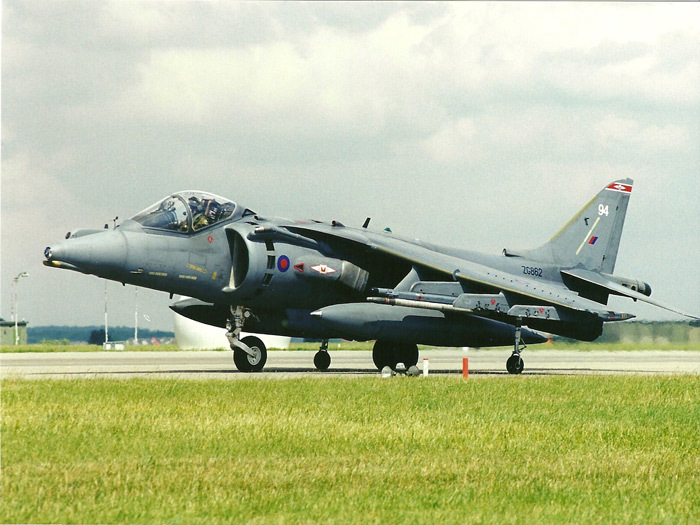 First to taxi for takeoff was a 100 Squadron Hawk (camera ship), followed by the nine Harriers, which took off and formed up before carrying out two diamond nine formations and landing back at Cottesmore. 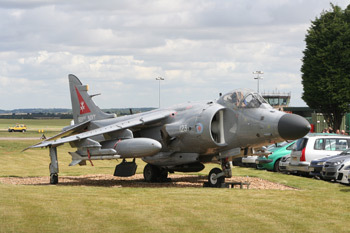 Cottesmore Families Day 2009 started off very well with the sun shining brightly with plenty to see around the airfield, including funfair rides, attractions and even some static aircraft on display. 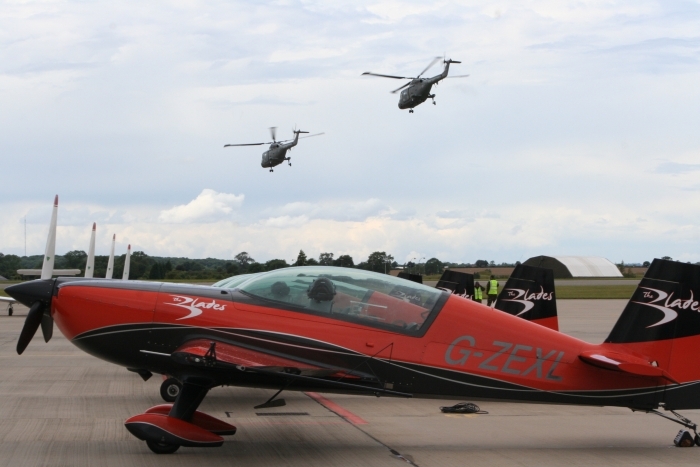 The Blades Display Team kicked off the show. 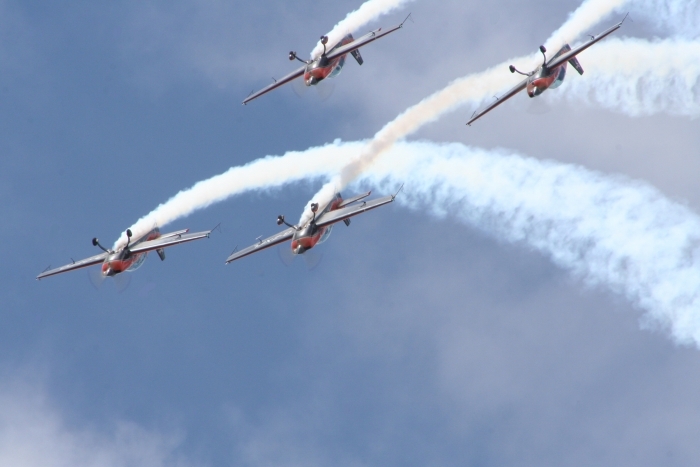 They gave a brilliant performance wowing the crowd with their impressive aerobatic moves. 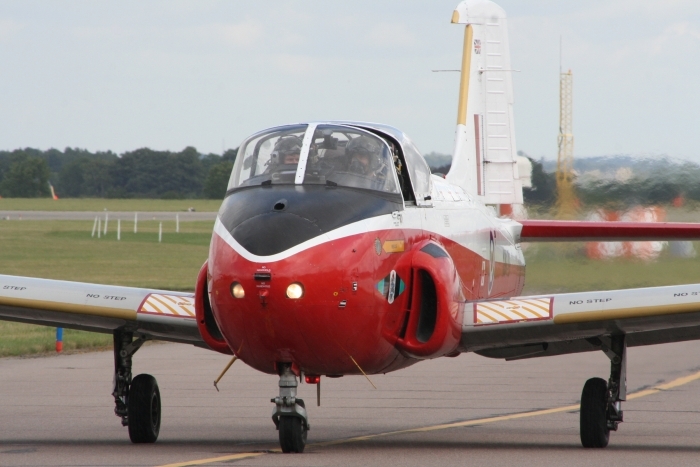 They were shortly followed by a classic jet, the Jet Provost. 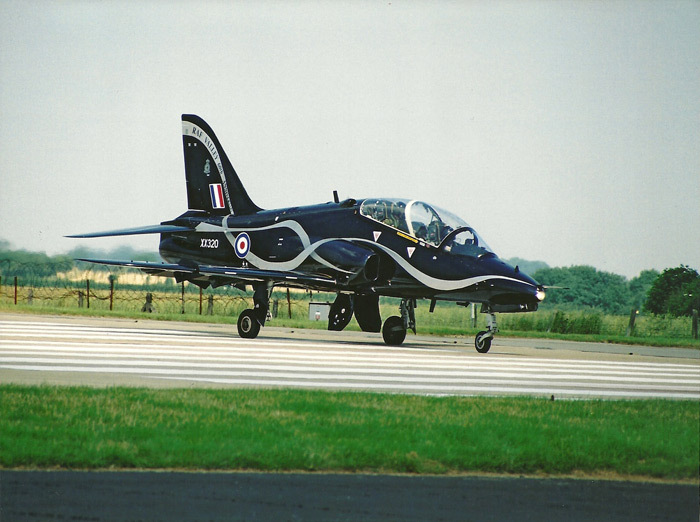 Then on to the RAF Hawk which gave a fantastic display. 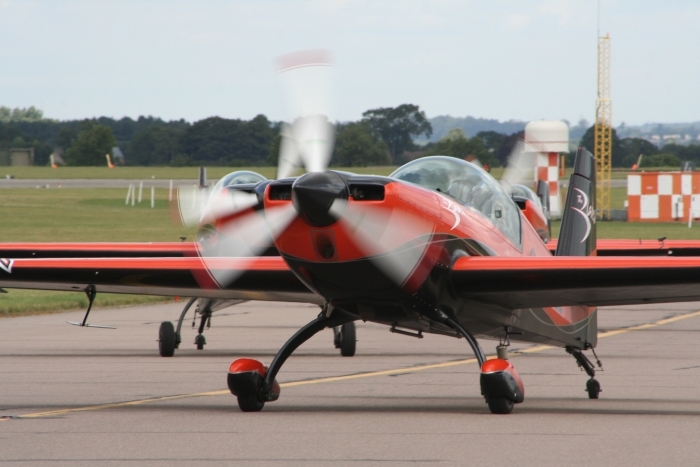 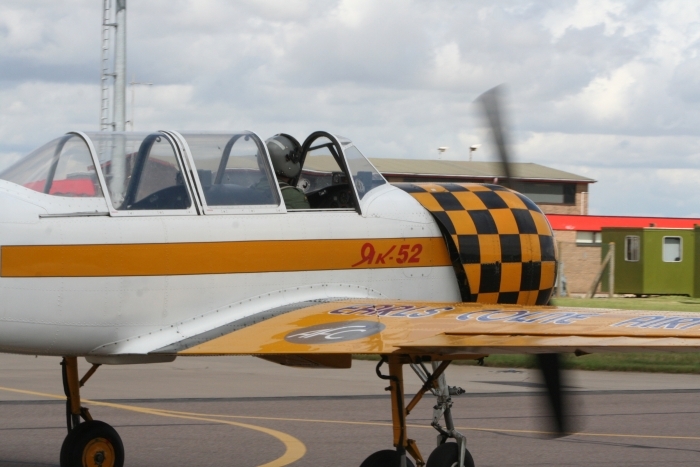 Nigel Wilson was up next in his Yak-52, another classic aircraft with the first Yak-52s flying in the mid 1970s. 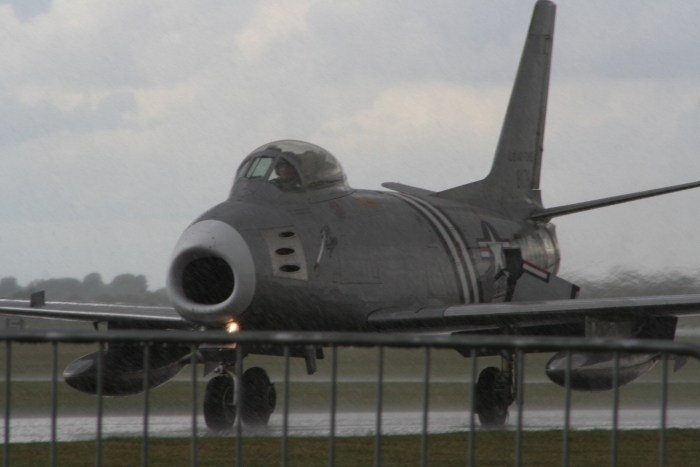 Mark Linney brought the Sabre in from Duxford and as usual gave a polished performance with the last part of his display and landing as the rain started to come down. 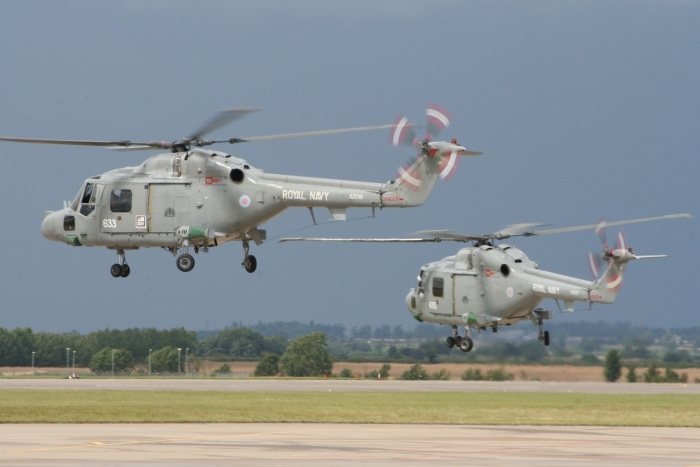 Next came a pair of Westland Lynxs known as The Black Cat Display Team. 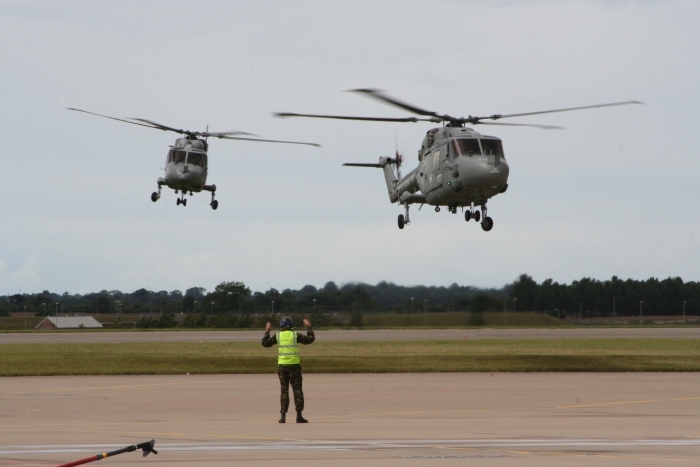 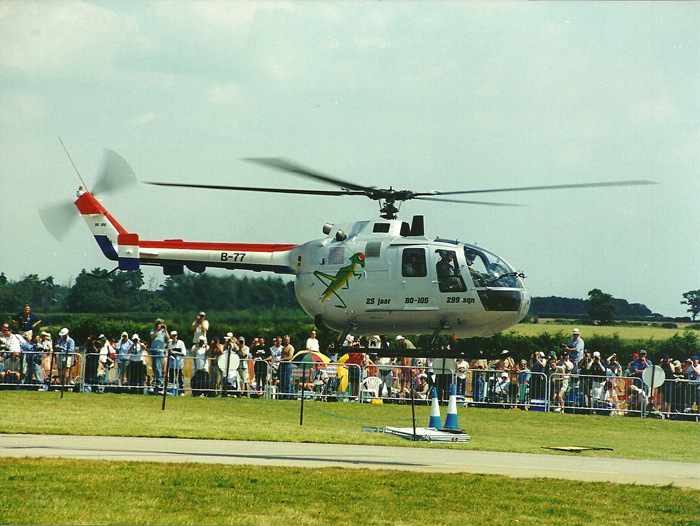 They demonstrated the sheer astonishing ability of these helicopters with a number of manoeuvres that they are able to perform. 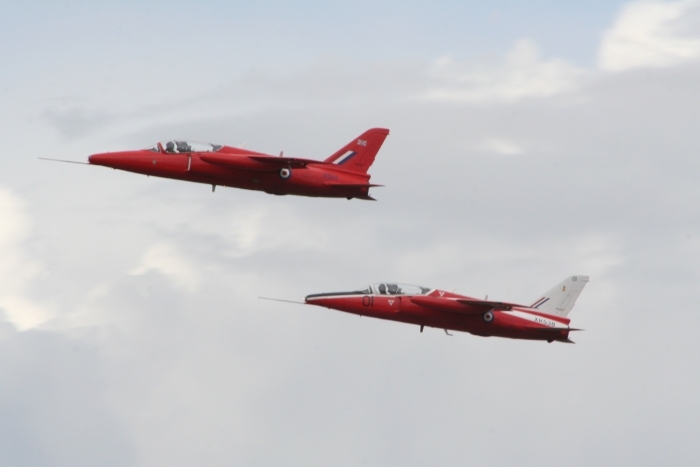 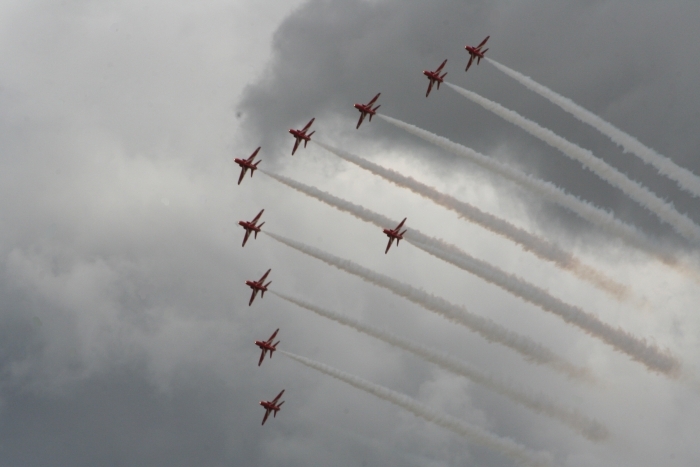 The Red Arrows performed two ten-ship flypasts as they transited across to Shawbury's Families Day. 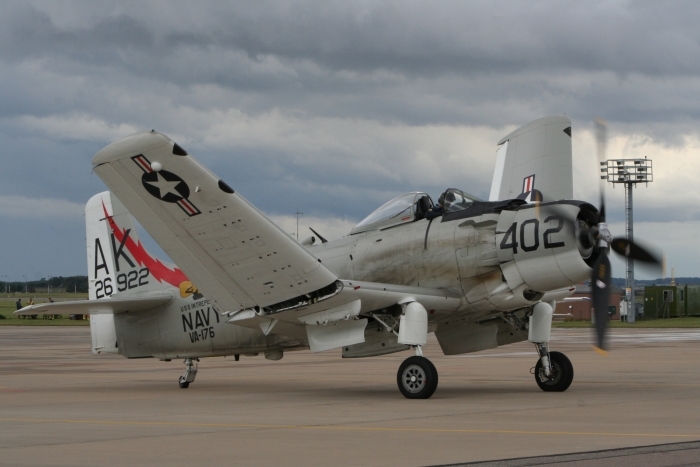 The Douglas A-1 Skyraider (another example of a classic aircraft) which was used by the Americans in the Korean War was next to display. 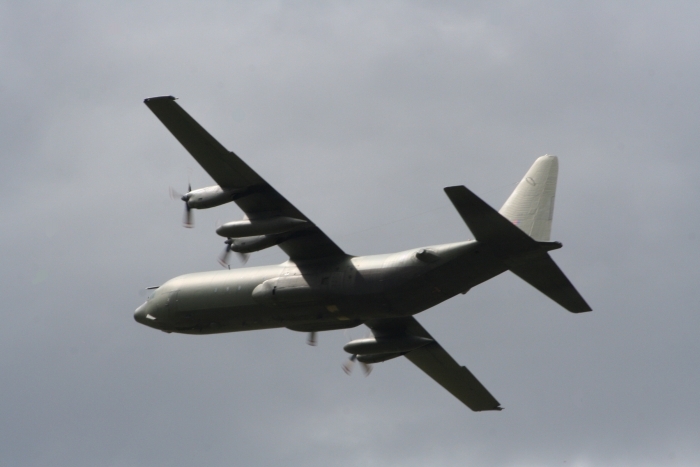 You don't realise the sheer size of this beast until you are up close to it! 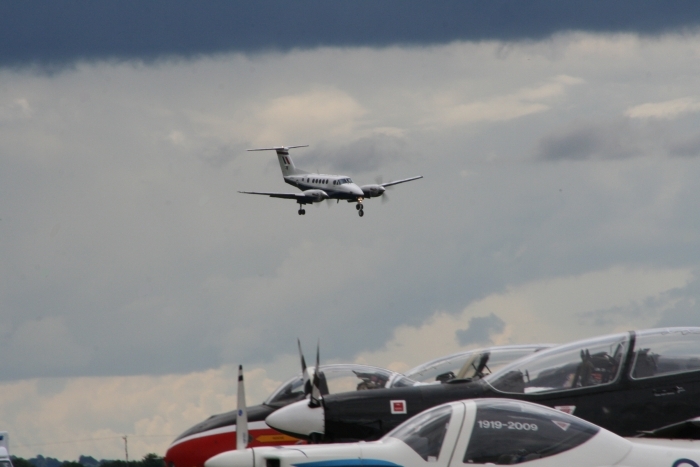 To a more modern aircraft, the King Air displayed by Leon Crease shows the versatility of these turboprop aircraft. 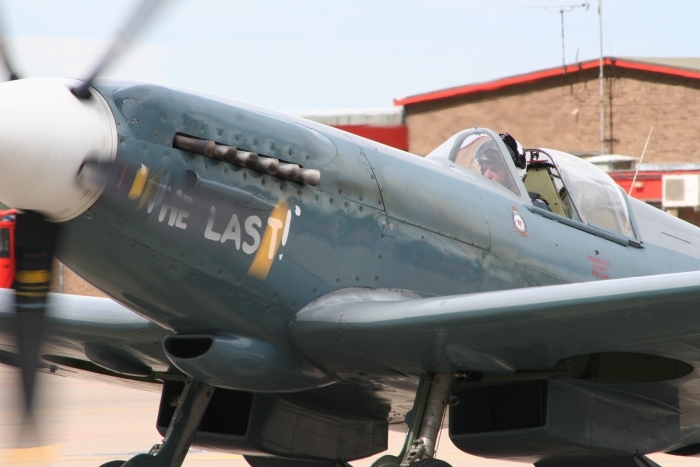 Squadron Leader Ian Smith displayed the BBMF's Mk XIX Spitfire PS915, proving that this much loved World War II aircraft is still worth its salt. 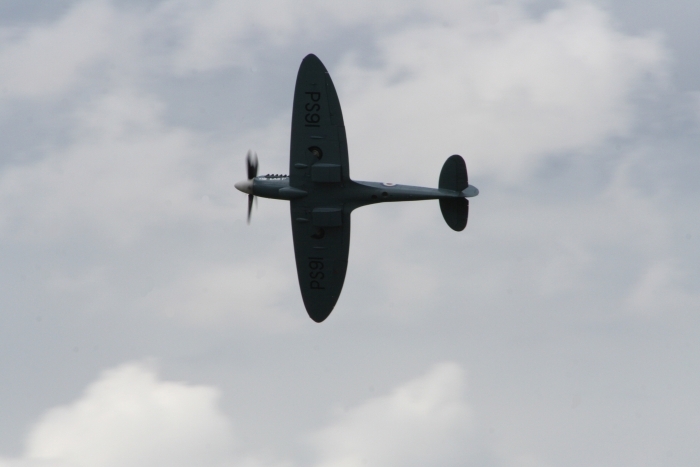 As always the beautiful sound of that Rolls-Royce Merlin engine filled the sky. 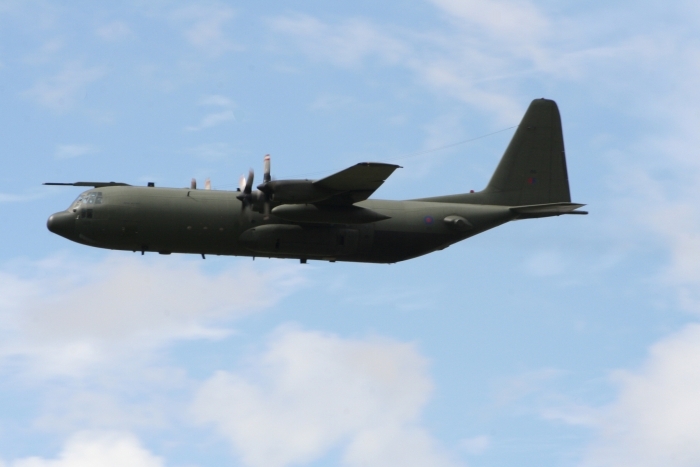 A very welcome participant was the C-130 Hercules which carried out several flypasts. 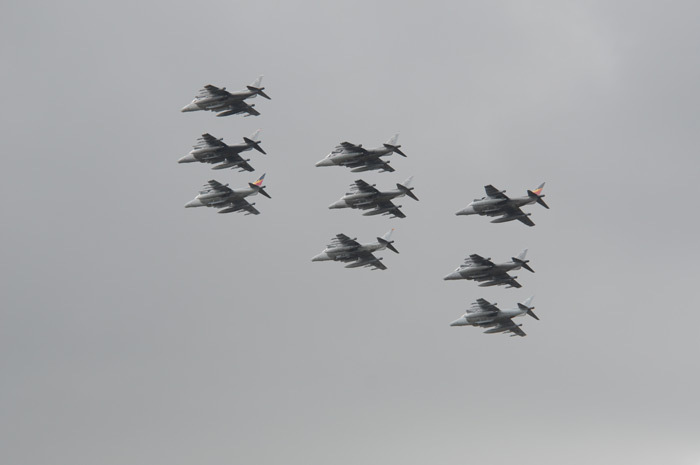 Bringing us back to the RAF's latest fighter was the Eurofighter Typhoon which came screaming through the sky with some impressive manoeuvres. 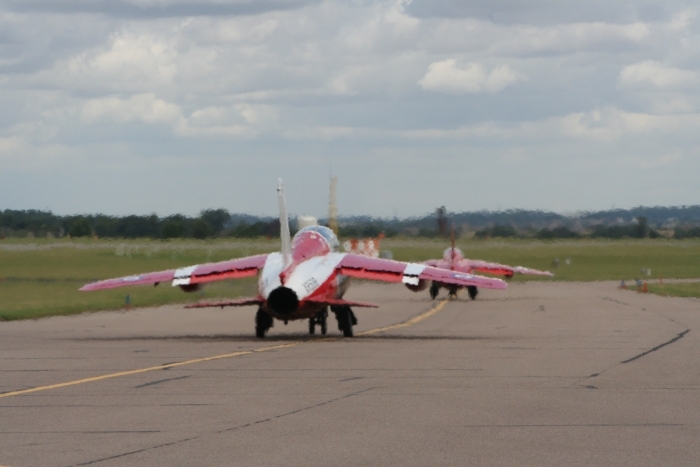 Also from The Battle of Britain Flight, the Dakota carried out its usual leisurely display followed by one of Cottesmore's Harriers demonstrating a role demo to close the show. 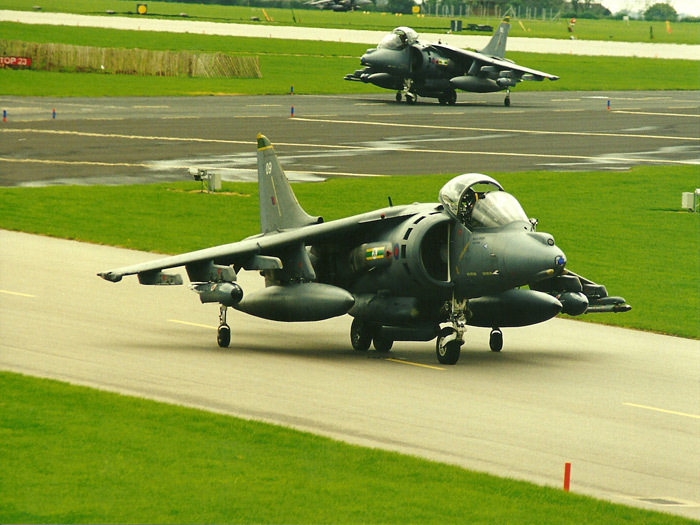 RAF Cottesmore hosted the second International Air Tattoo on the 28th/29th July 2001 due to ongoing work at Fairford, the RIAT's normal home. 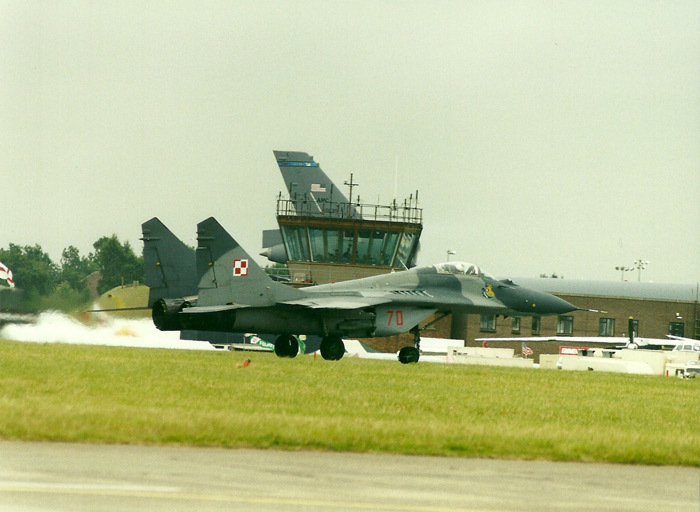 Over 350 aircraft from thirty nations flew into Cottesmore for what was one of Europe's biggest air shows. With temperatures in the mid 80s and near perfect conditions the air show attracted an estimated 200,000 visitors. 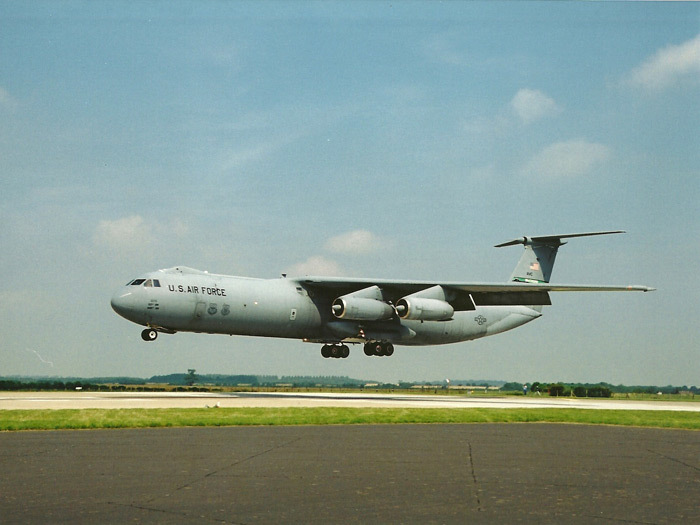 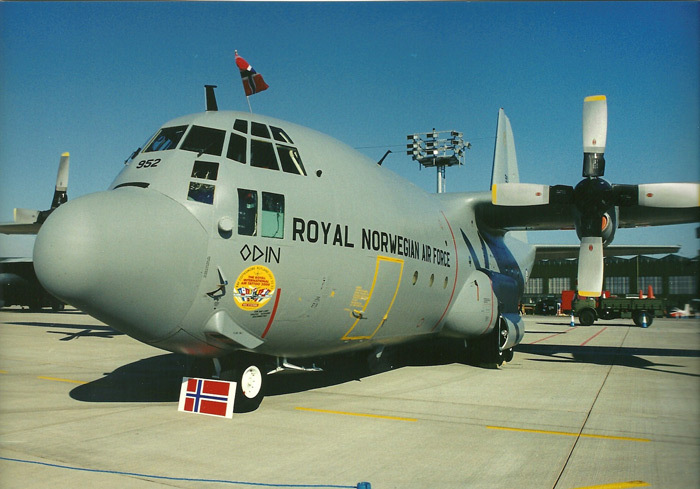 As usual there was a mix of popular display teams, such as the RAF's Red Arrows, through to rare aircraft like the C-130 weather Herc (Snoopy), with American aircraft participating including the C-141 Starlifter and the F-117 Nighthawk. 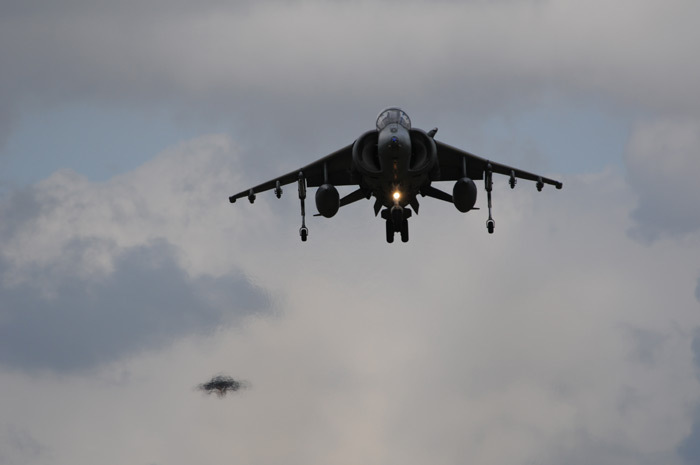 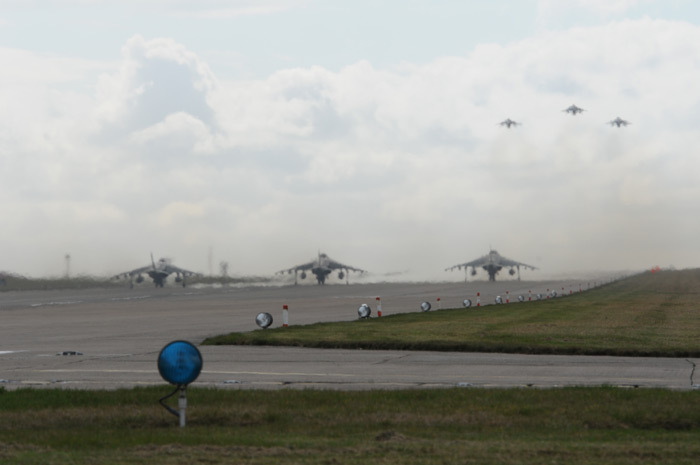 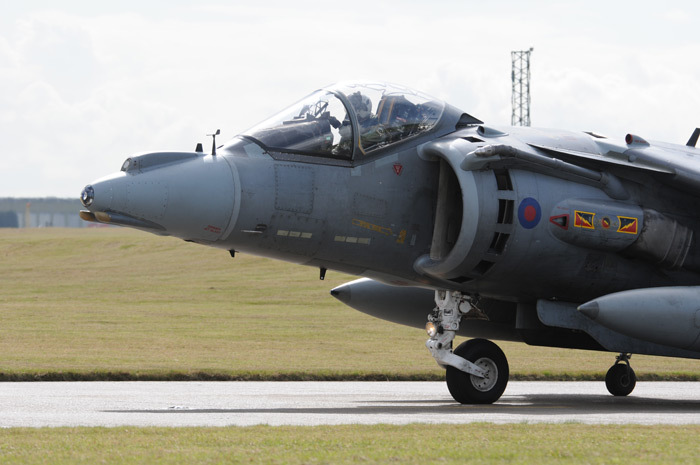 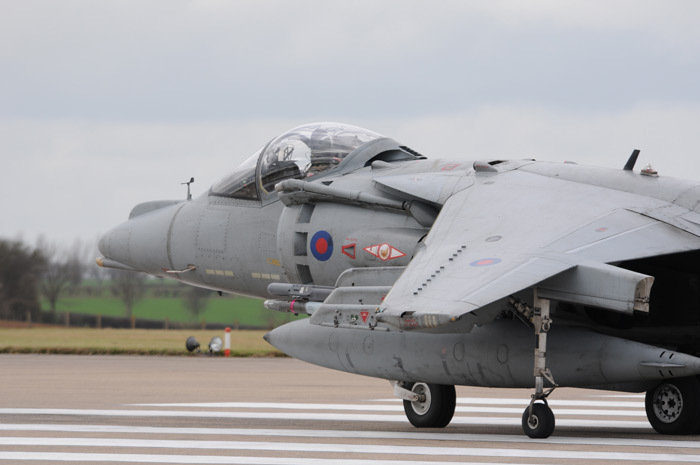 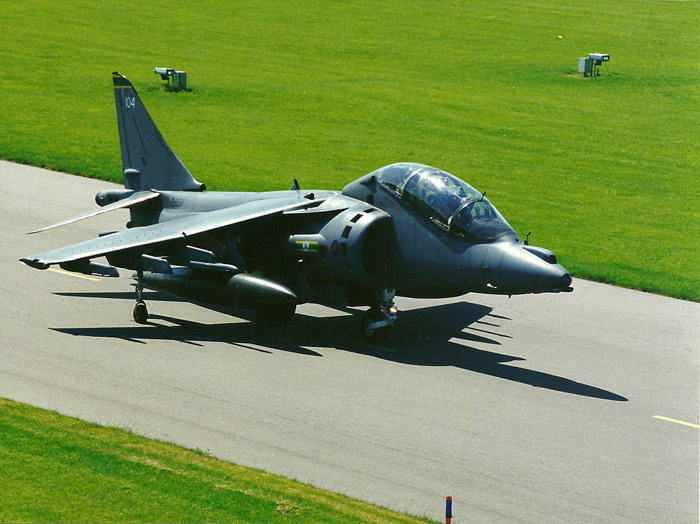 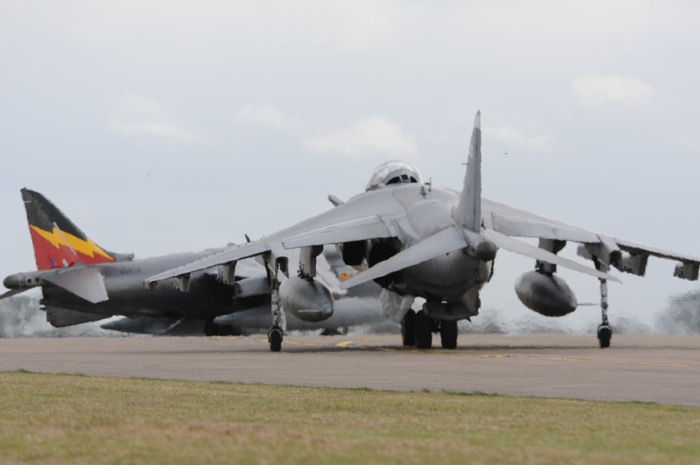 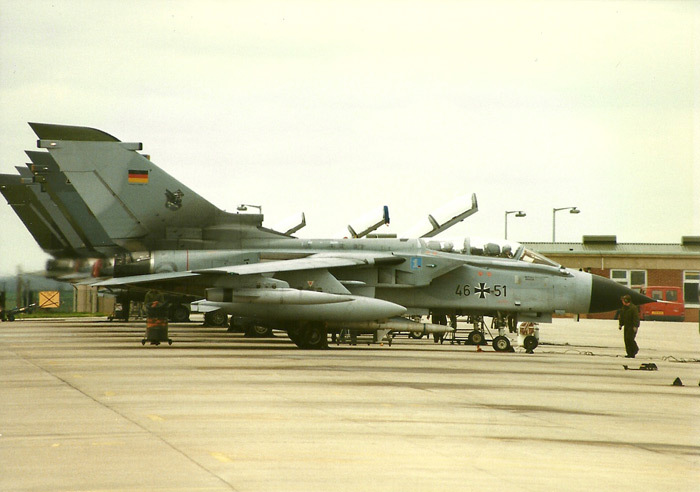 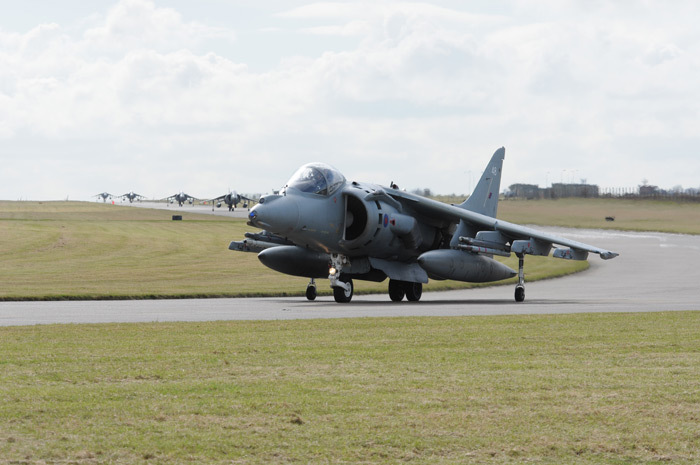 RAF Cottesmore became the home to the Harrier with the arrival of the two squadrons from Germany. 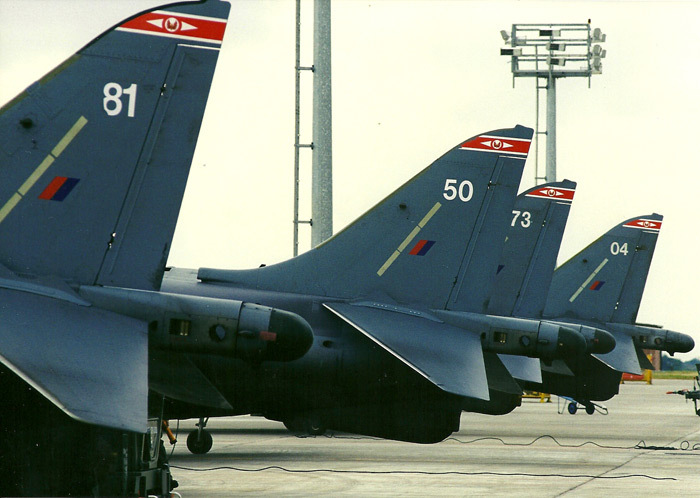 Number 3 (F) and Number IV Squadron arrived in 1999, shortly followed by Number 1 (F) which we moved over from RAF Wittering. 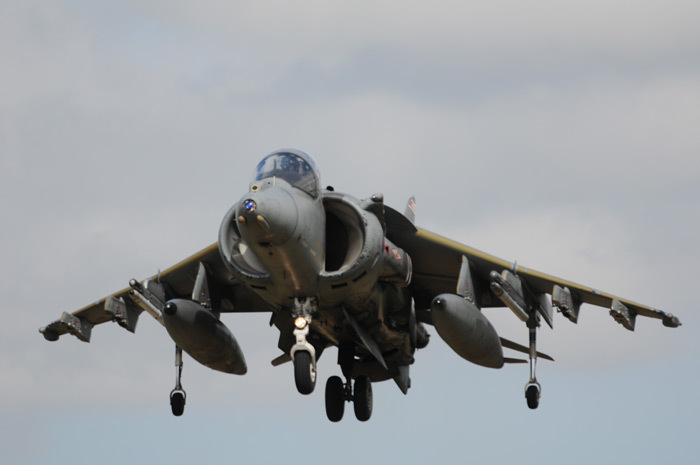 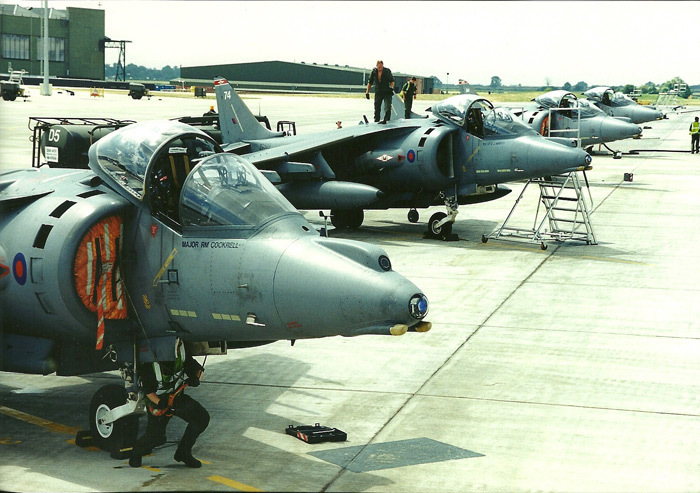 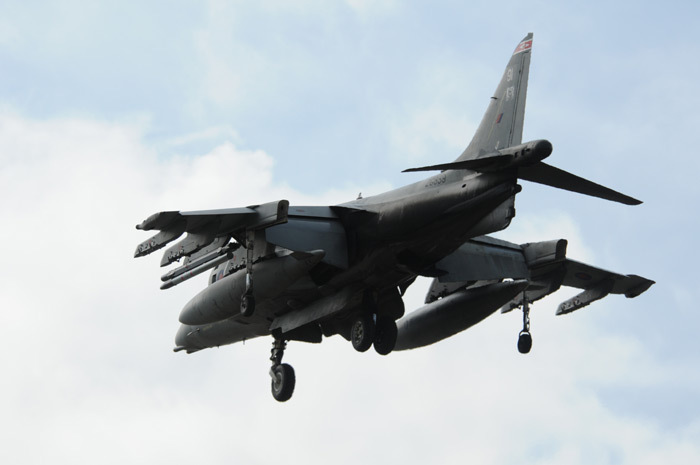 It was planned for the Navy's Sea Harriers to move to Cottesmore, but both 800 and 801 Naval Air Squadrons disbanded and the Sea Harriers were retired. 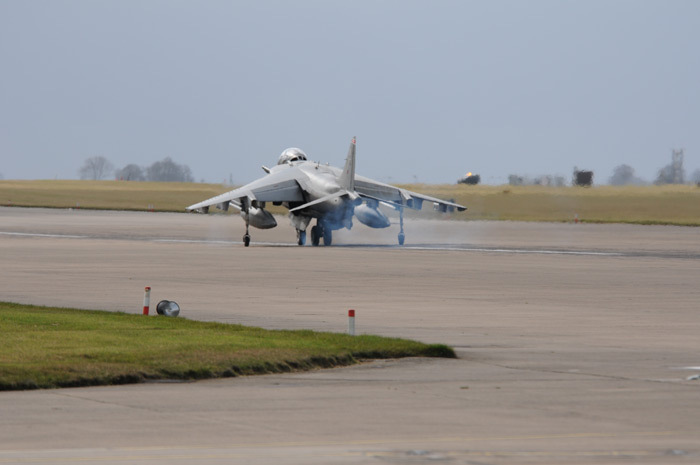 On 31st March 2006, 3 (F) Squadron disbanded and later in the day 800 Naval Air Squadron (NAS) recommissioned at Cottesmore, and in 2008 were joined by 801 to form The Naval Strike at Cottesmore. 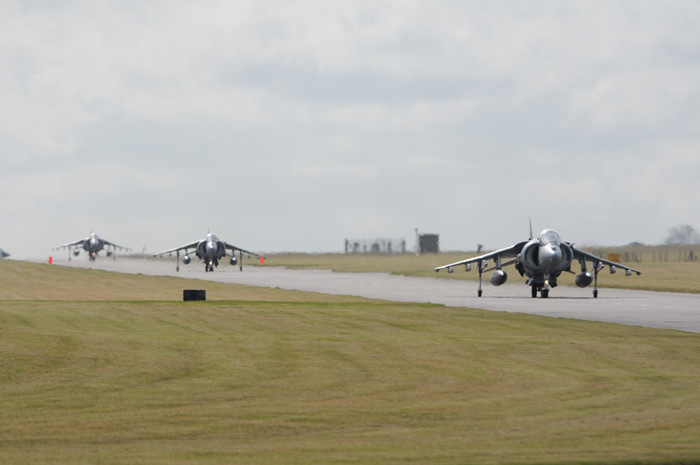 With Fairford closed for maintenance work the International Air Tattoo was moved to RAF Cottesmore. 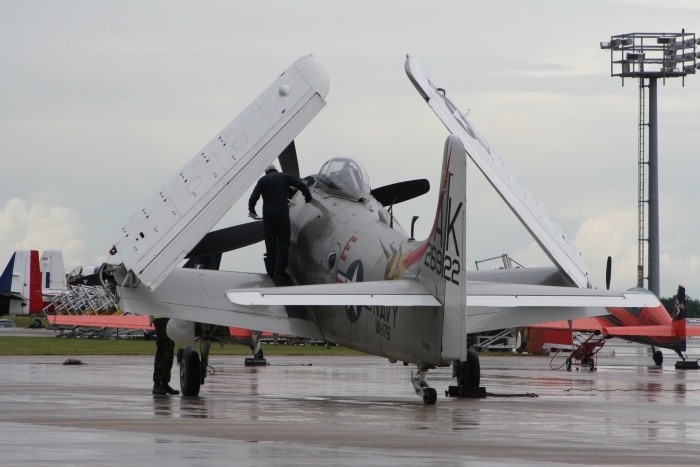 Weather conditions were far from perfect, with a low cloud base which made it impossible for some of the aircraft to perform. 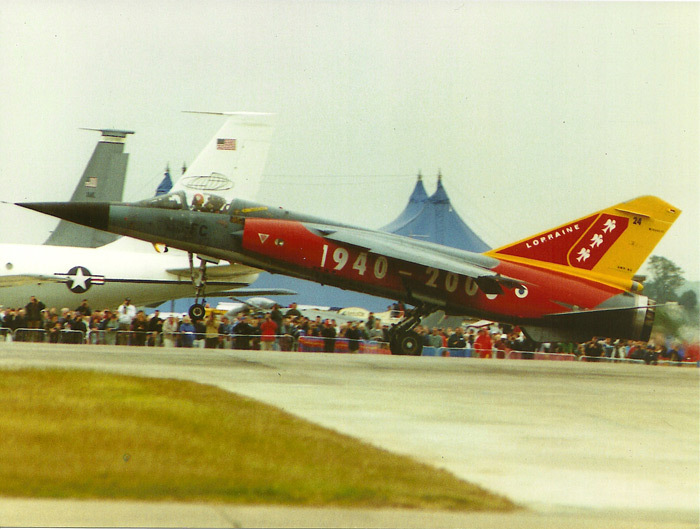 As usual for a RIAT Air Show, aircraft from around the world attended. 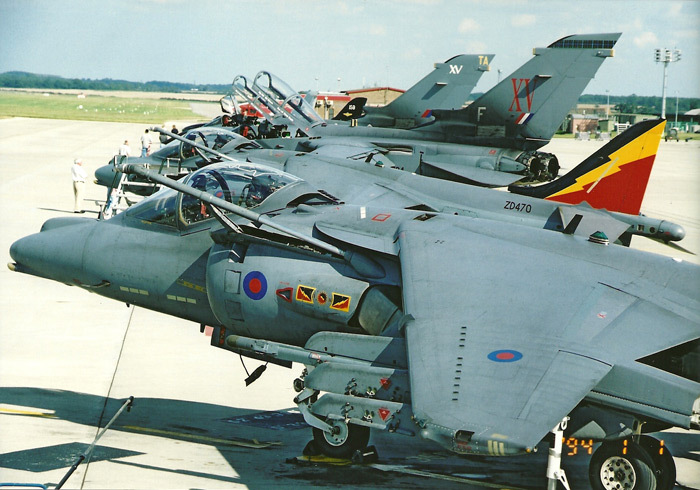 These included (from the larger aircraft) C-130 Hercules, E-3 Sentry, Douglas DC-4 and (from the fighters) McDonnell Douglas F-4 Phantom, various Tornados, CF-18 Hornets and MiG-29 Fulcrum. 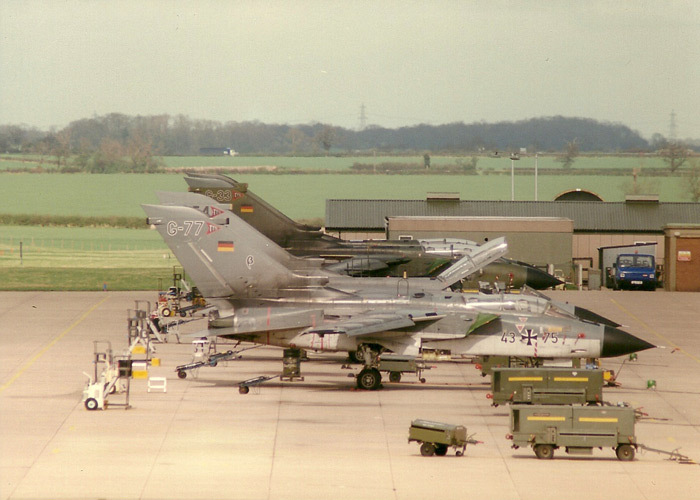 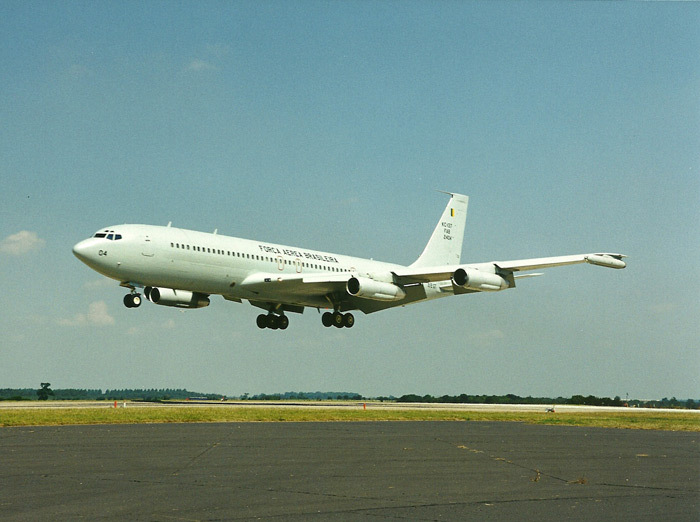 RAF Cottesmore became the home to the Tri-National Training Establishment (TTTE) in early 1981. 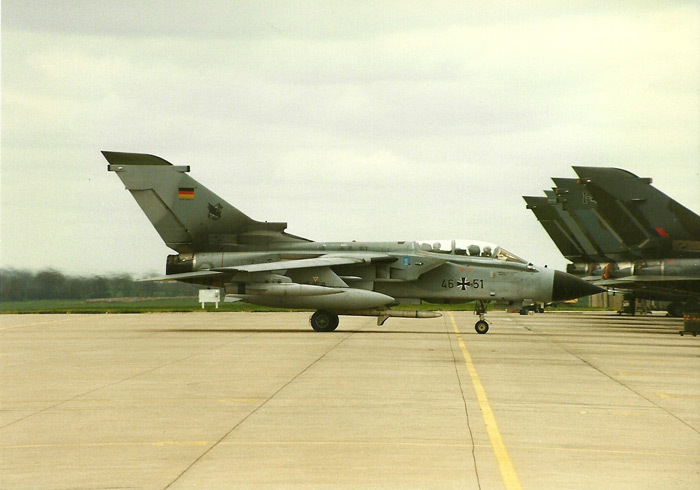 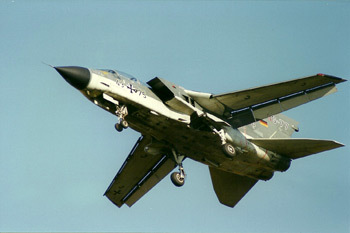 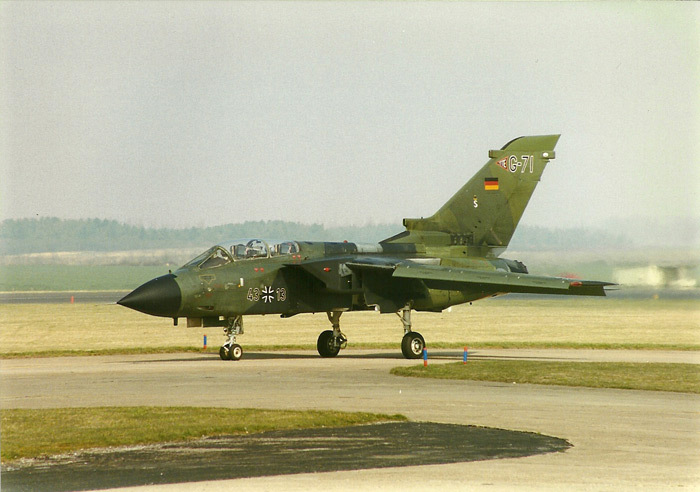 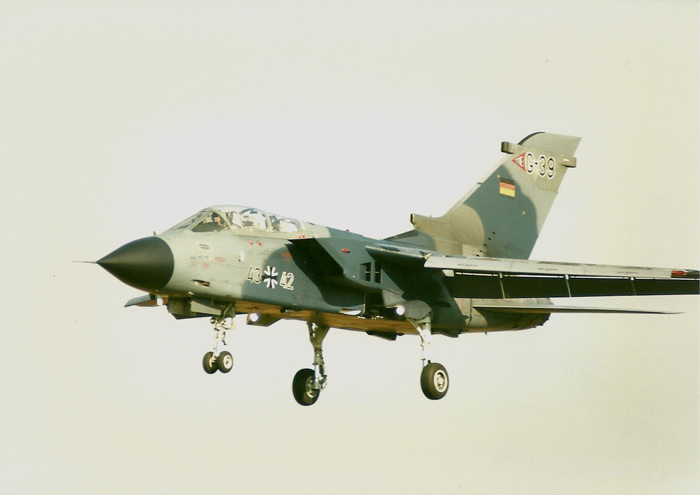 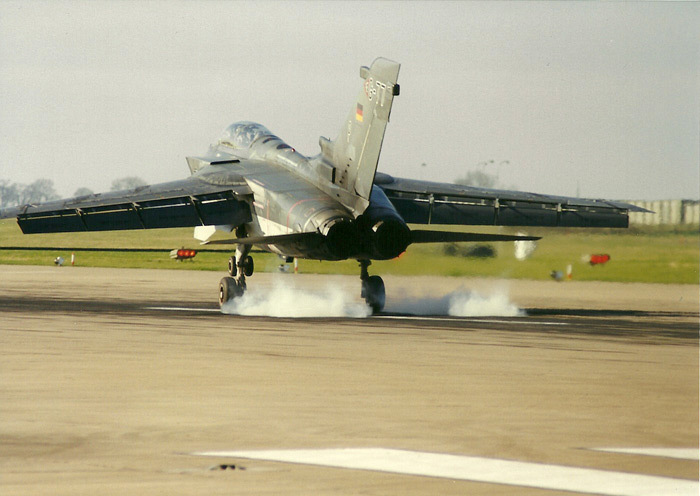 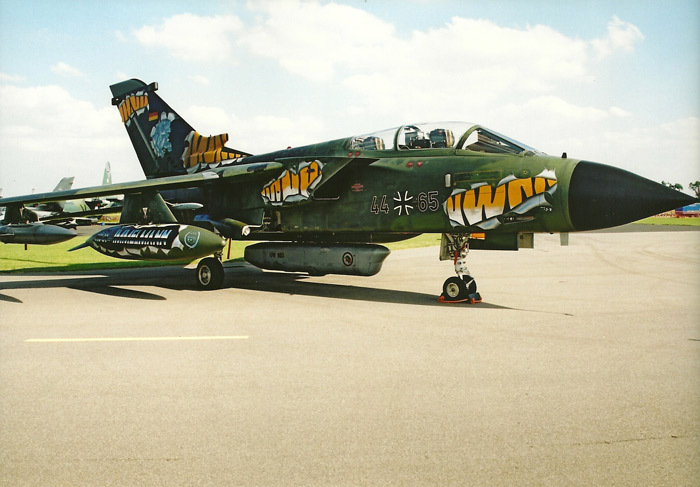 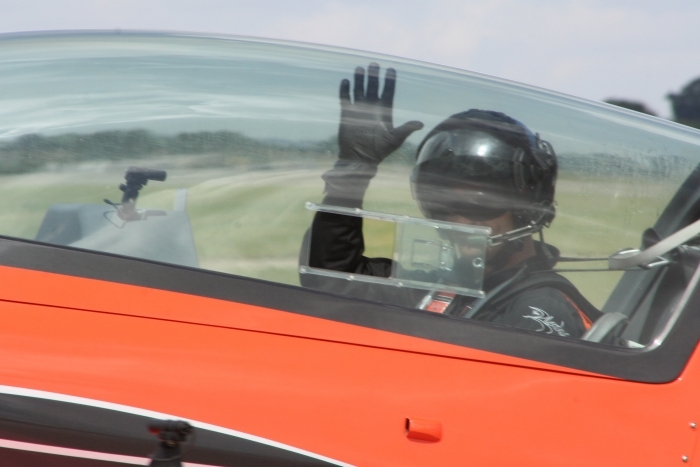 Which undertook the training of the Panavia Tornado pilots from the RAF, Luftwaffe, German Navy and Italian Air Force. 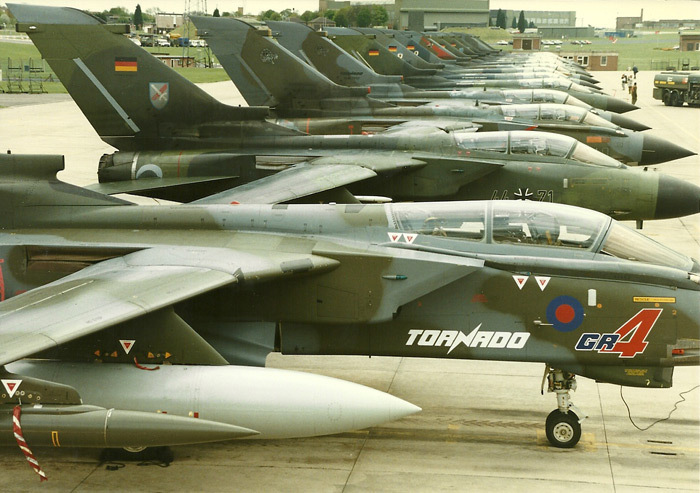 Cottesmore operated a large number of GR1 Tornados from one large dispersal and was one of the RAF's busiest Tornado stations in the country.